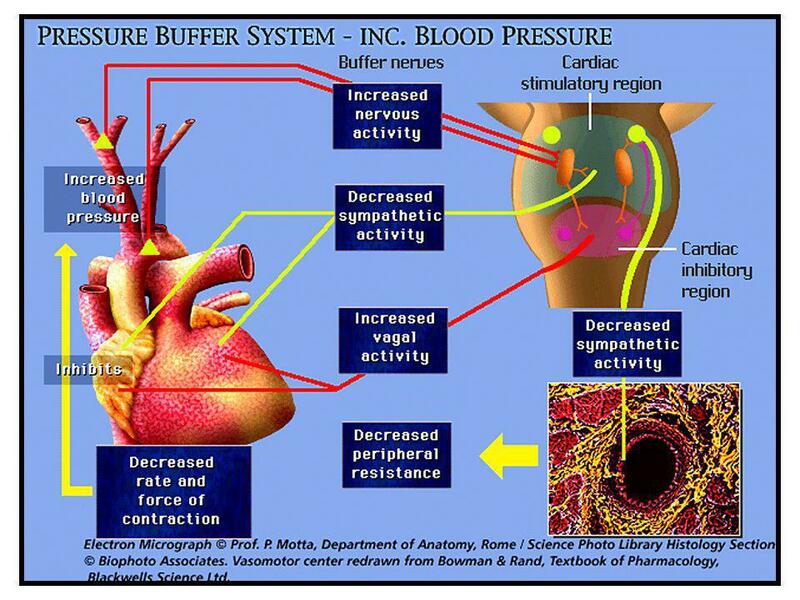 Adjustment of blood flow tissue by tissue is mainly the function of local tissue blood flow control mechanisms. 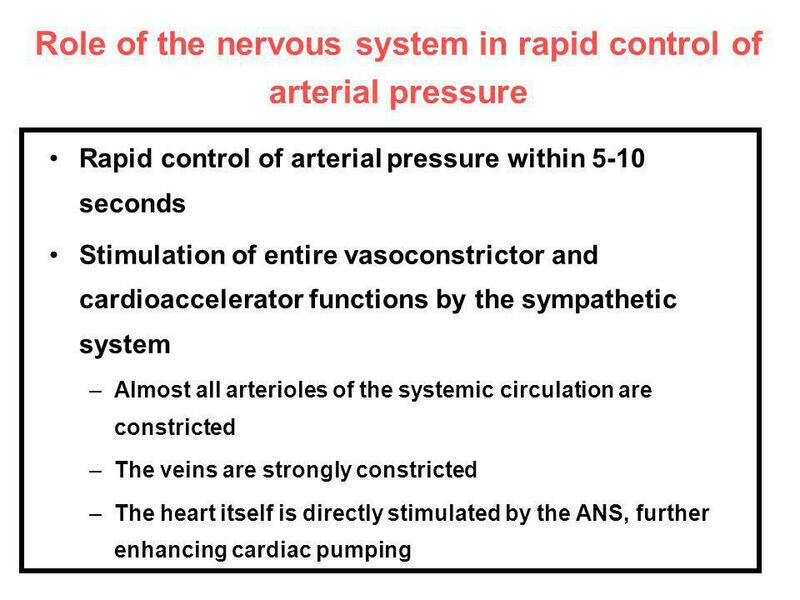 The nervous control of the circulation has more global functions, such as redistributing blood flow to different areas of the body, increasing or decreasing pumping activity by the heart, and, especially, providing very rapid control of systemic arterial pressure. 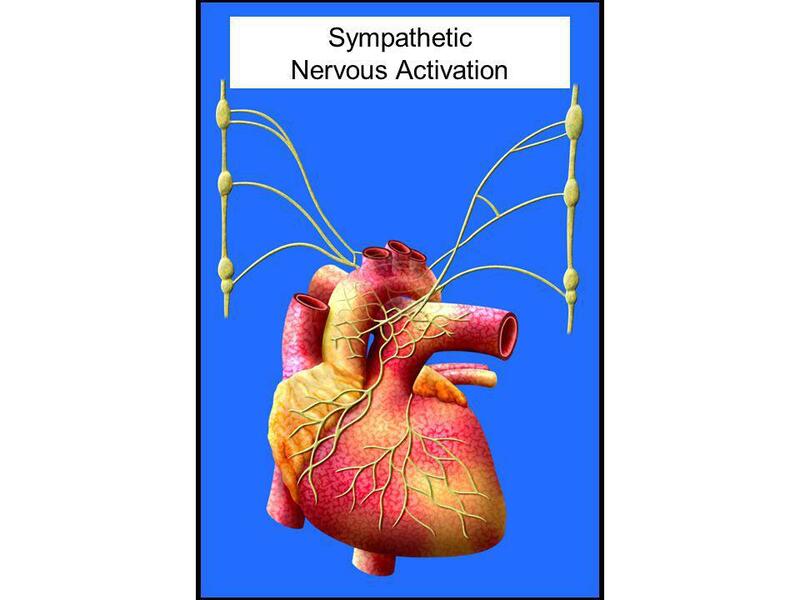 The nervous system controls the circulation almost entirely through the autonomic nervous system. 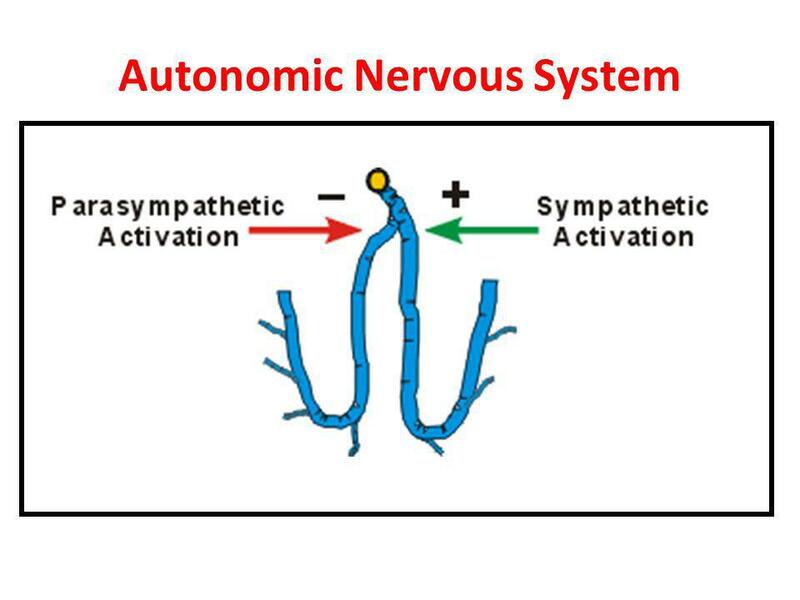 By far the most important part of the autonomic nervous system for regulating the circulation is the sympathetic nervous system. 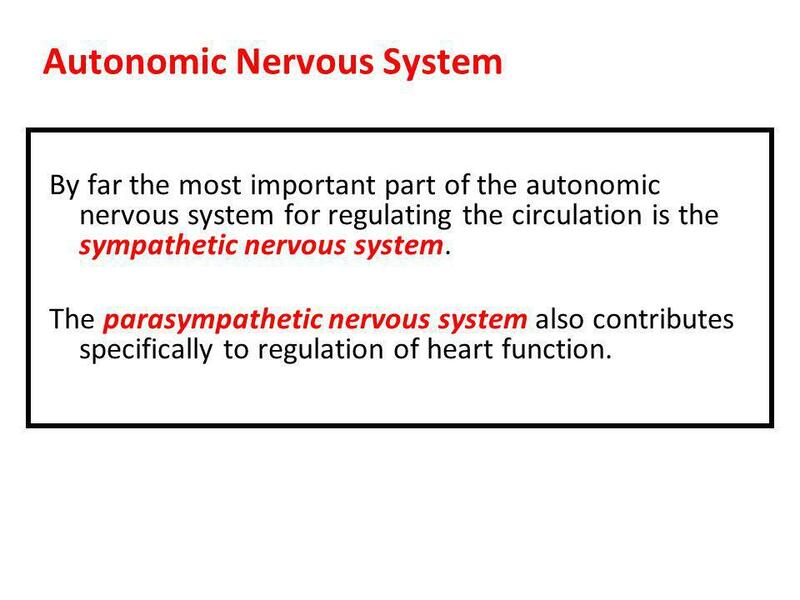 The parasympathetic nervous system also contributes specifically to regulation of heart function. 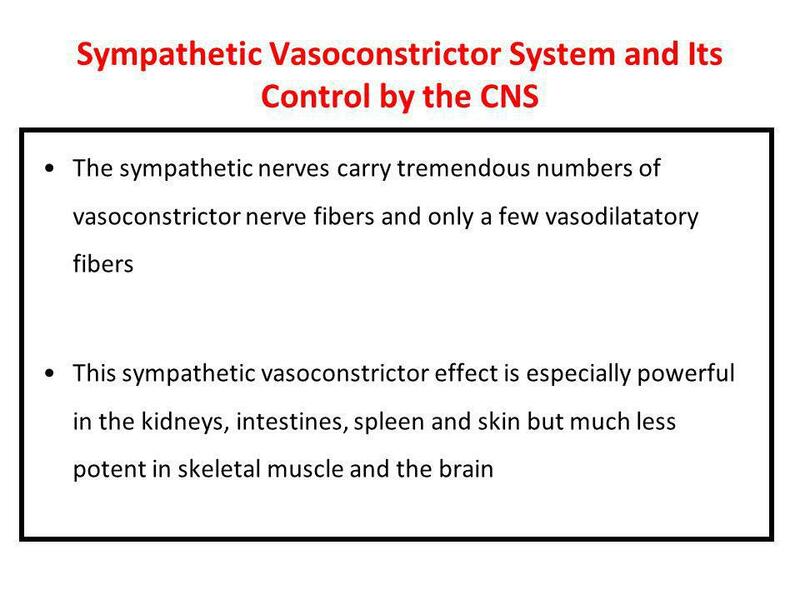 Sympathetic vasomotor nerve fibers leave the spinal cord through all the thoracic spinal nerves and through the first one or two lumbar spinal nerves. 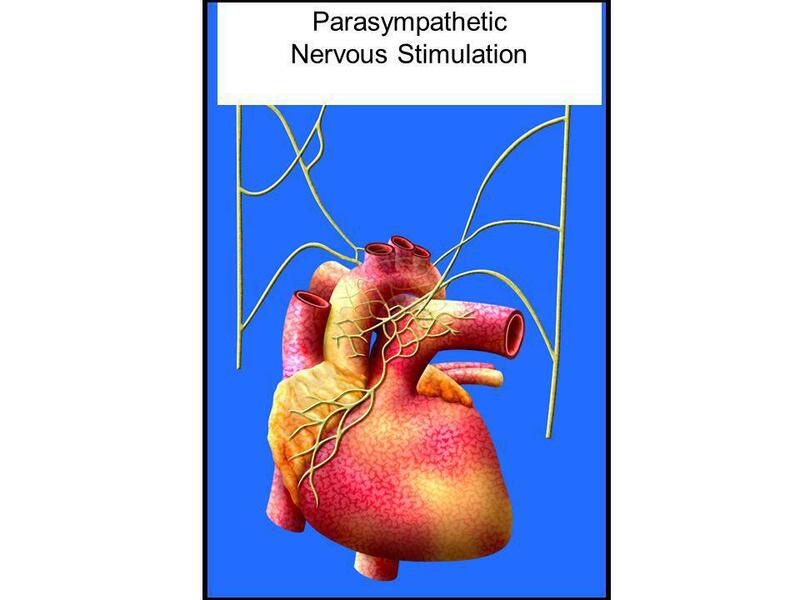 They then pass immediately into a sympathetic chain, one of which lies on each side of the vertebral column. 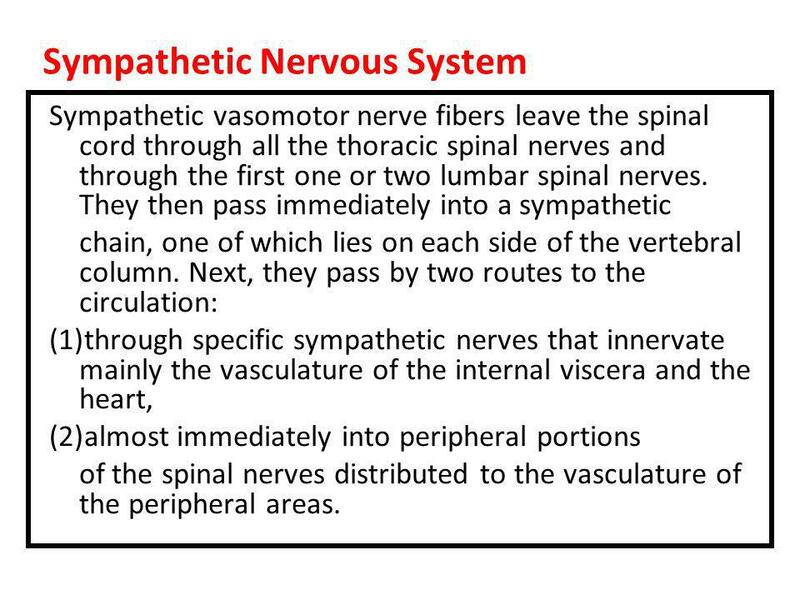 Next, they pass by two routes to the circulation: through specific sympathetic nerves that innervate mainly the vasculature of the internal viscera and the heart, almost immediately into peripheral portions of the spinal nerves distributed to the vasculature of the peripheral areas. 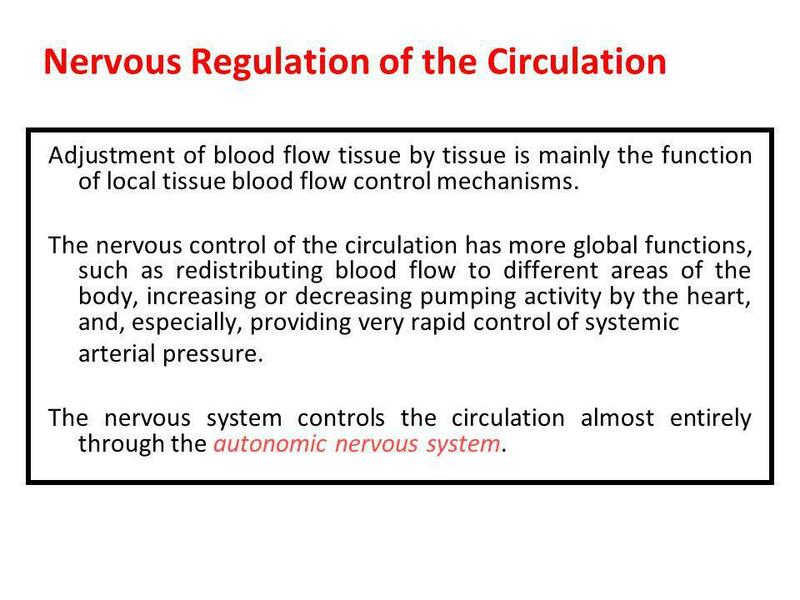 nervous control of the circulation. 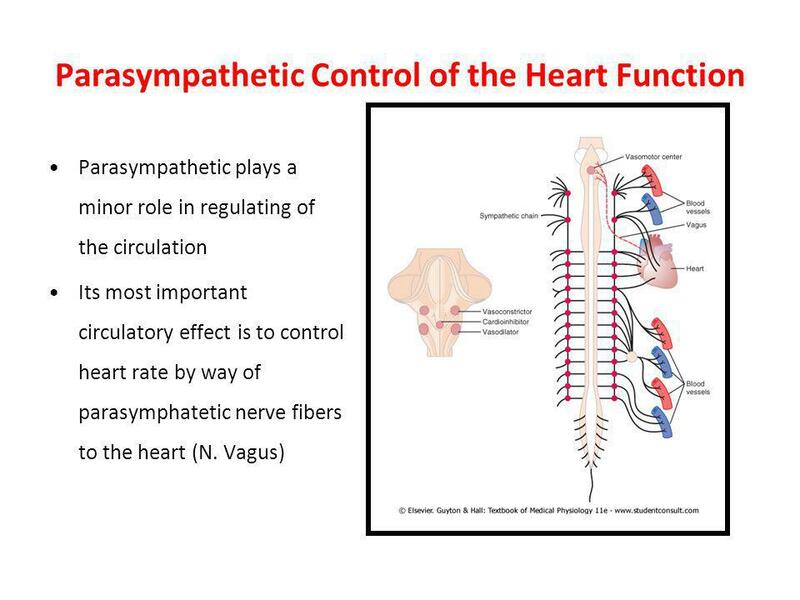 Also shown by the red dashed line is a vagus nerve that carries Parasympathetic signals to the heart. 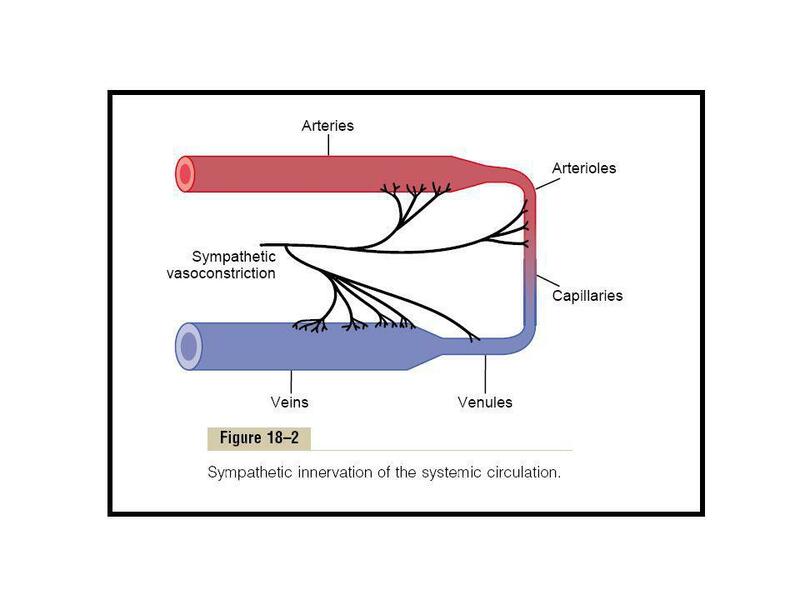 In most tissues all the vessels except the precapillary sphincters, metarterioles and capillaries, are innervated. 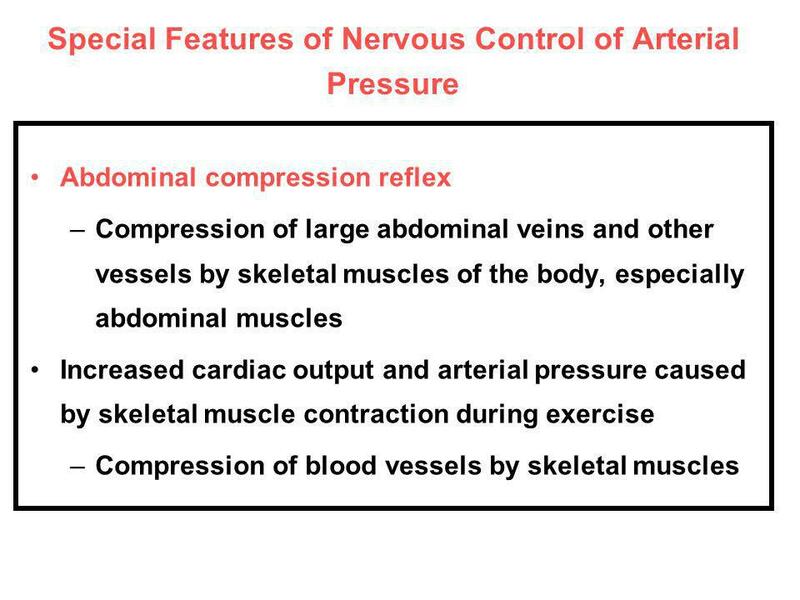 The innervation of the small arteries and arterioles allows sympathetic stimulation to increase resistance to blood flow and thereby to decrease rate of blood flow through the tissues. 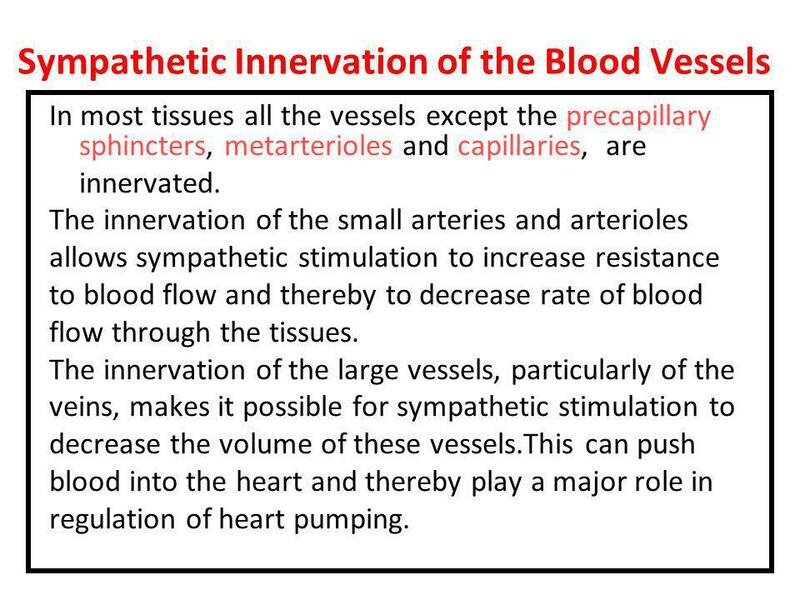 The innervation of the large vessels, particularly of the veins, makes it possible for sympathetic stimulation to decrease the volume of these vessels.This can push blood into the heart and thereby play a major role in regulation of heart pumping. 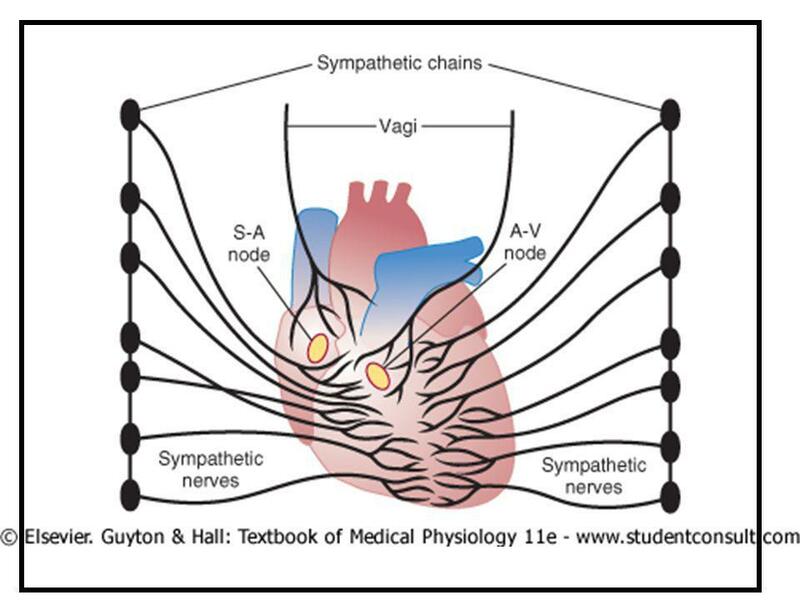 12 Sympathetic Nerve Fibers to the Heart. 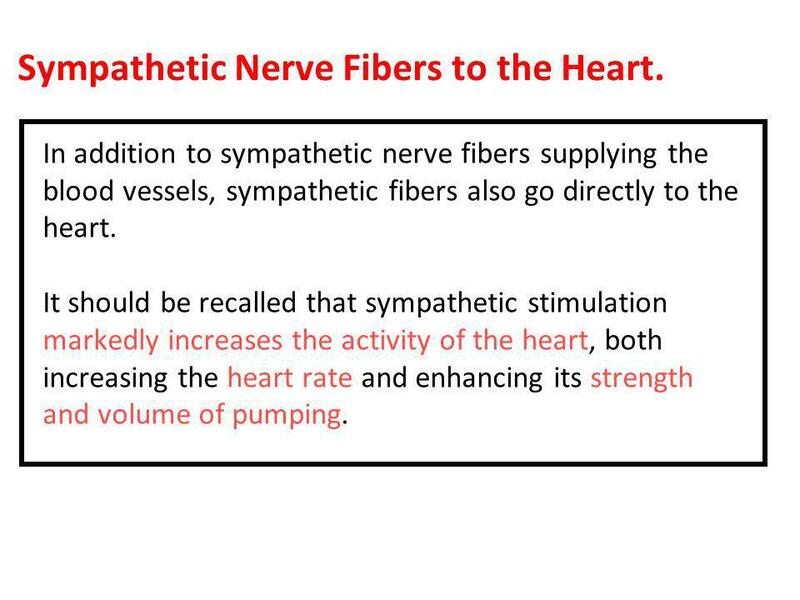 In addition to sympathetic nerve fibers supplying the blood vessels, sympathetic fibers also go directly to the heart. 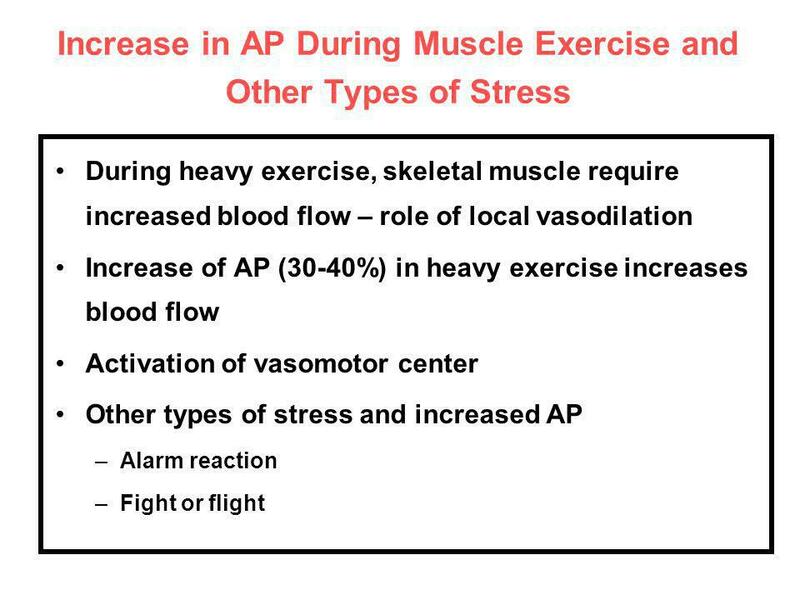 It should be recalled that sympathetic stimulation markedly increases the activity of the heart, both increasing the heart rate and enhancing its strength and volume of pumping. 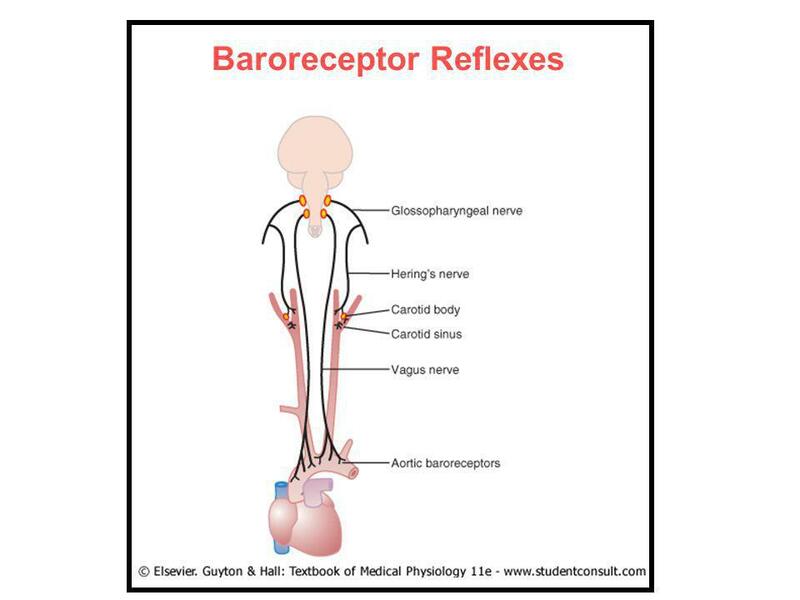 24 Anatomy: Baroreceptors are clusters of bare sensory nerve endings buried within the elastic layers of the aorta and the carotid sinus. 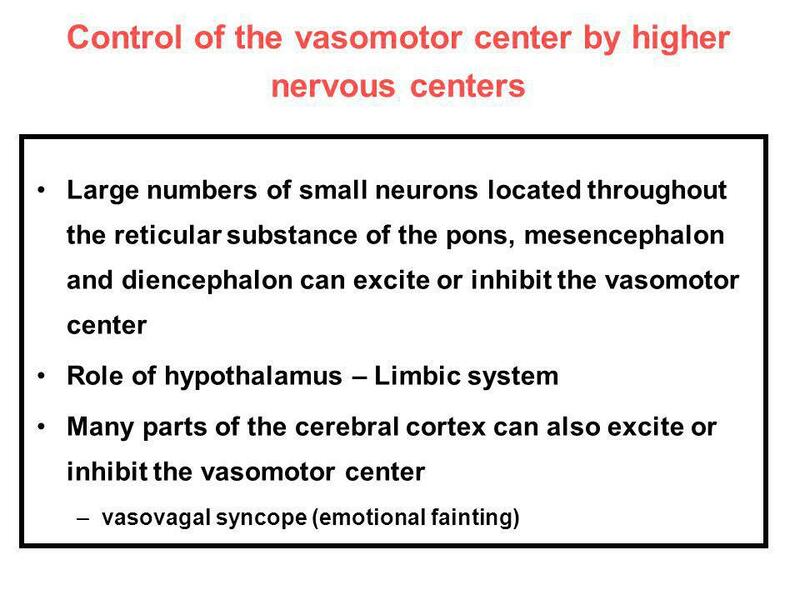 Information from the former is relayed to the brain via sensory afferents traveling in the aortic nerve and the vagus nerve (cranial nerve [CN] X). 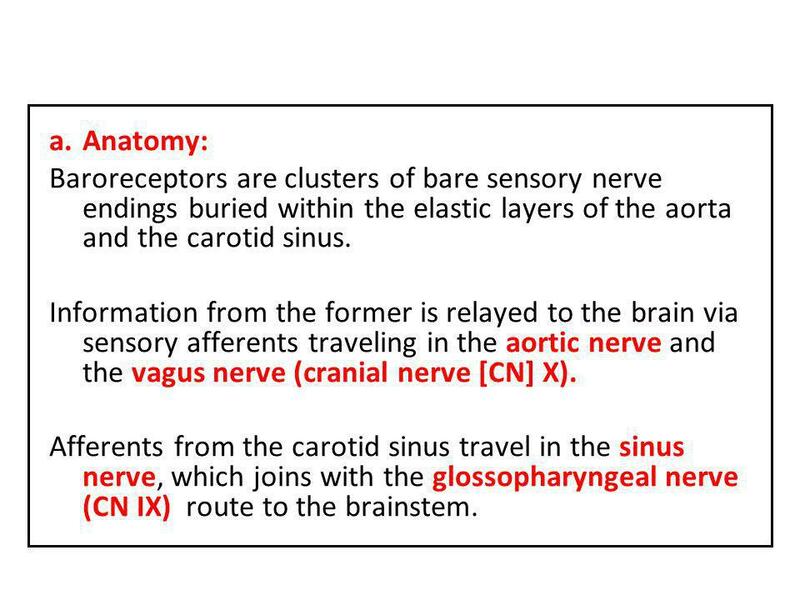 Afferents from the carotid sinus travel in the sinus nerve, which joins with the glossopharyngeal nerve (CN IX) route to the brainstem. 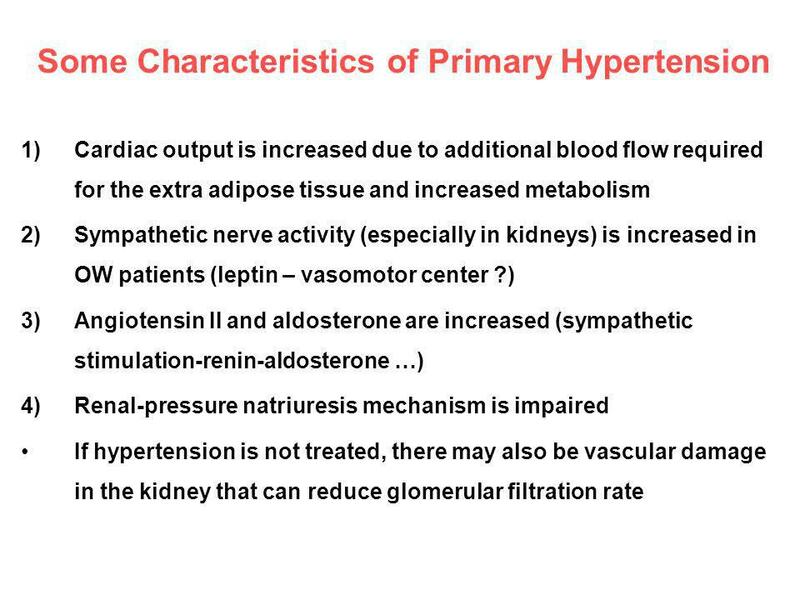 25 b. 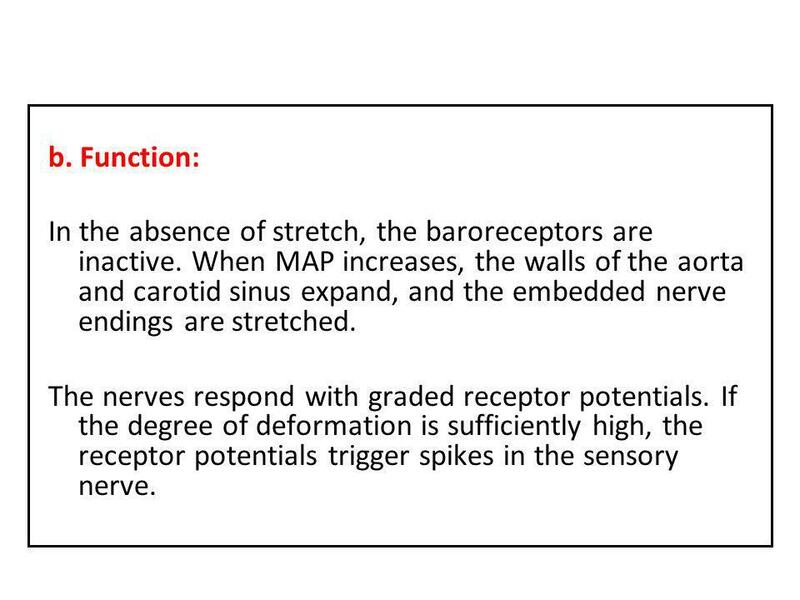 Function: In the absence of stretch, the baroreceptors are inactive. 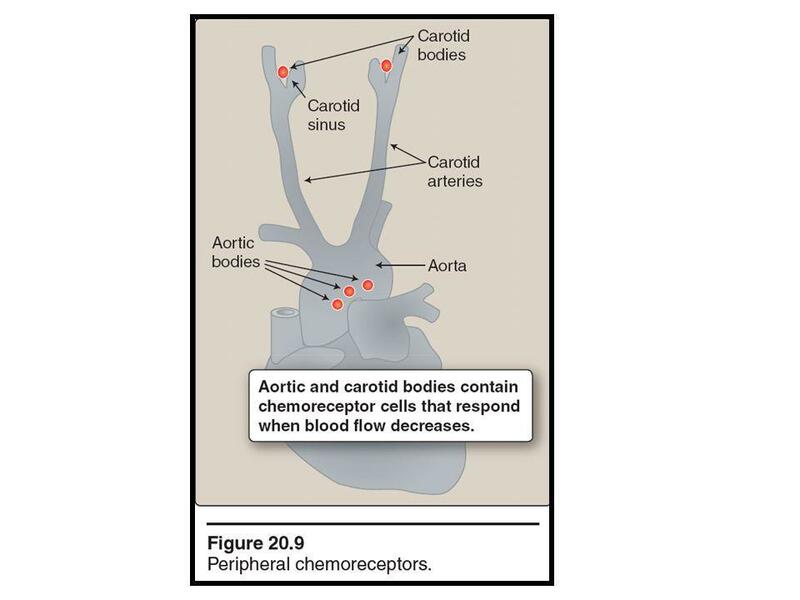 When MAP increases, the walls of the aorta and carotid sinus expand, and the embedded nerve endings are stretched. 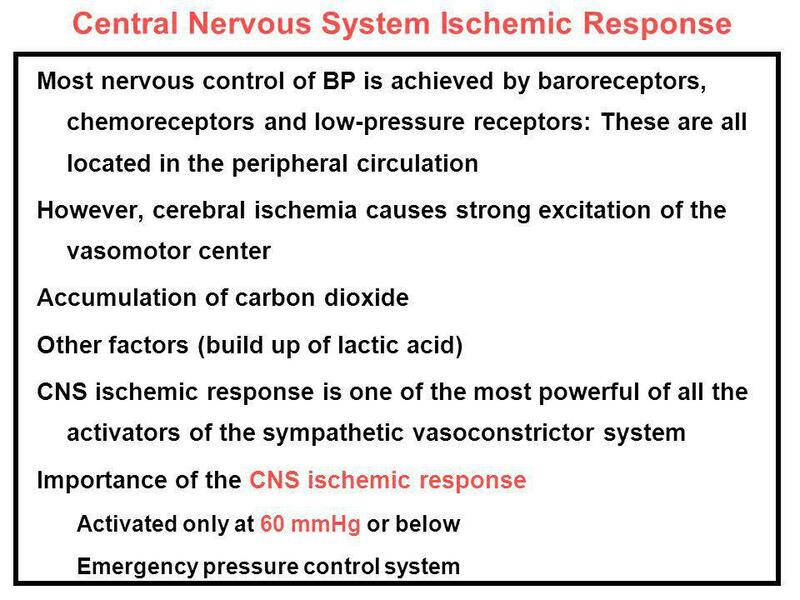 The nerves respond with graded receptor potentials. 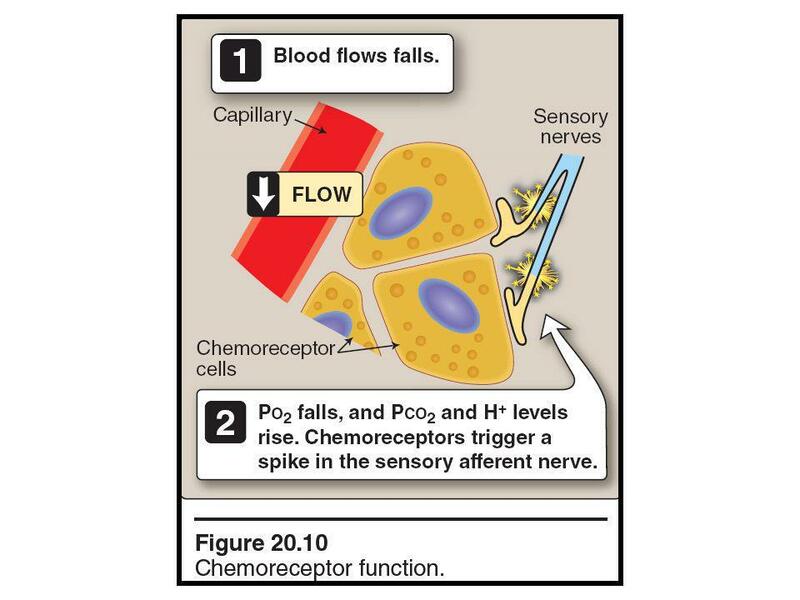 If the degree of deformation is sufficiently high, the receptor potentials trigger spikes in the sensory nerve. 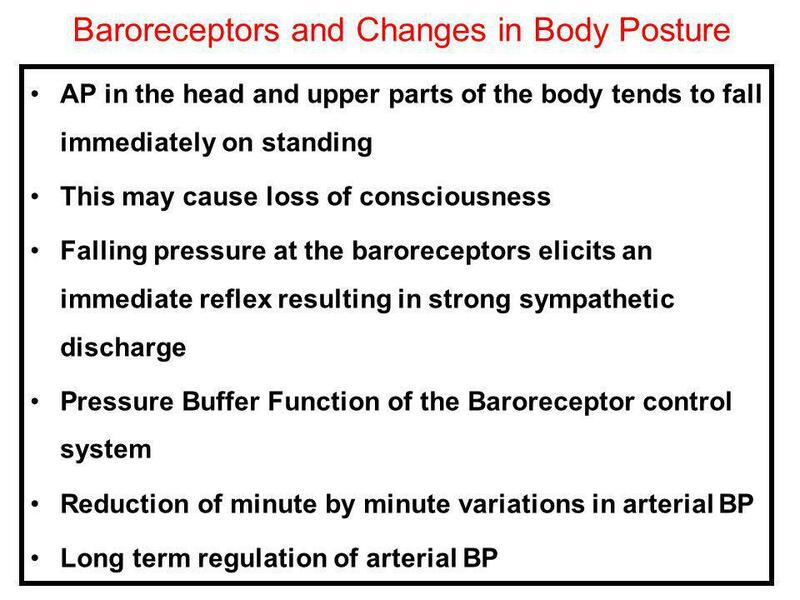 26 Baroreceptors are especially sensitive to changes in pressure, responding to the sharp rise in pressure that occurs during rapid ejection with strong depolarization and a train of high frequency spikes. 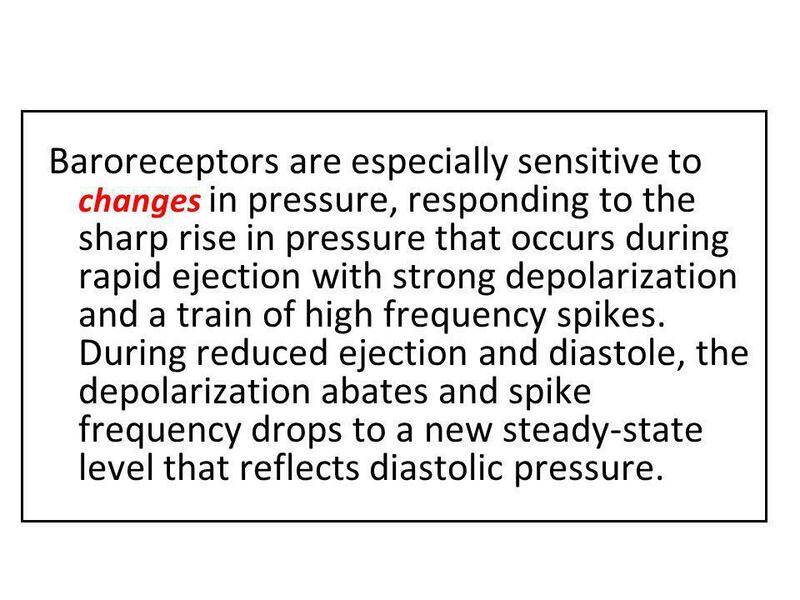 During reduced ejection and diastole, the depolarization abates and spike frequency drops to a new steady-state level that reflects diastolic pressure. 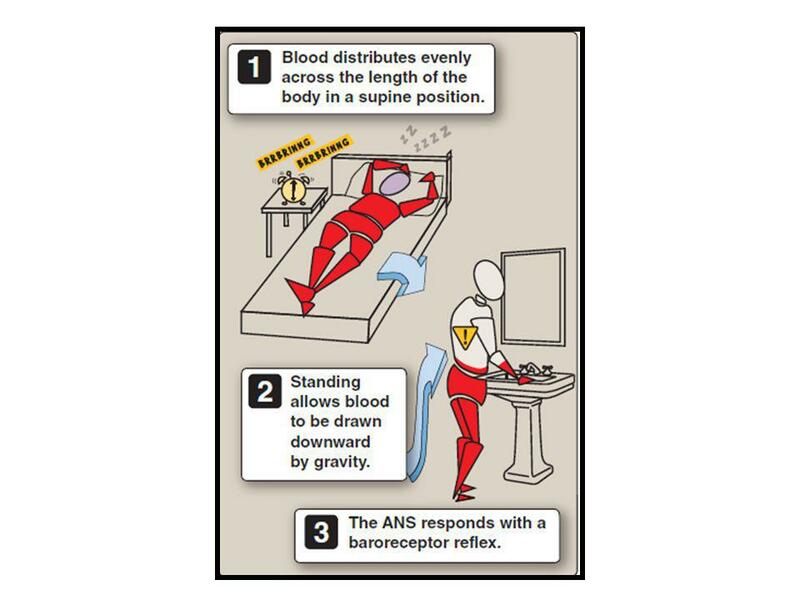 Stretch-sensitivity varies from one nerve ending to the next, thereby allowing for responsiveness over a wide pressure range. 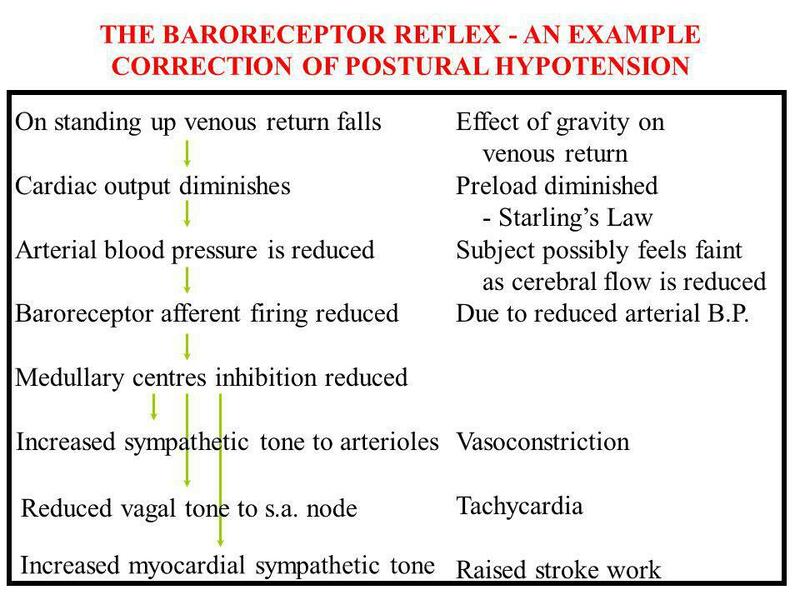 The carotid baroreceptors have a response threshold of around 50 mm Hg and saturate at 180 mm Hg. 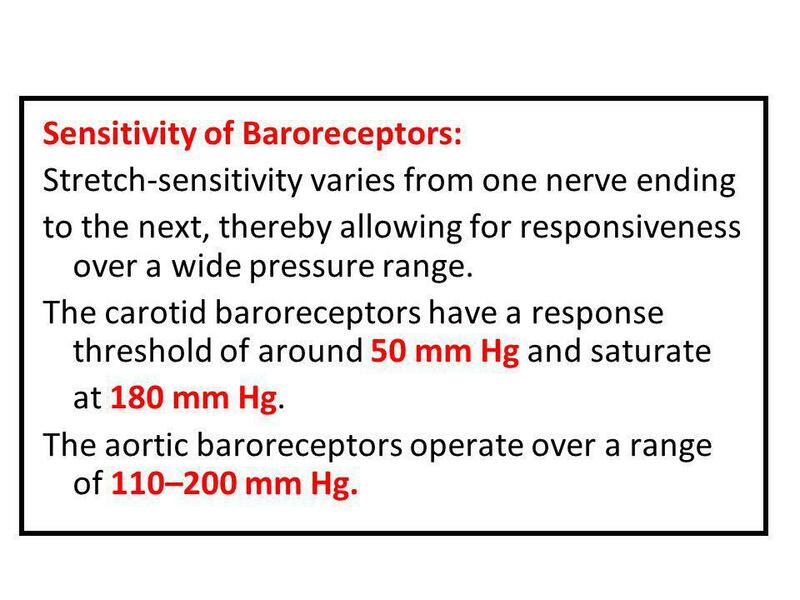 The aortic baroreceptors operate over a range of 110–200 mm Hg. 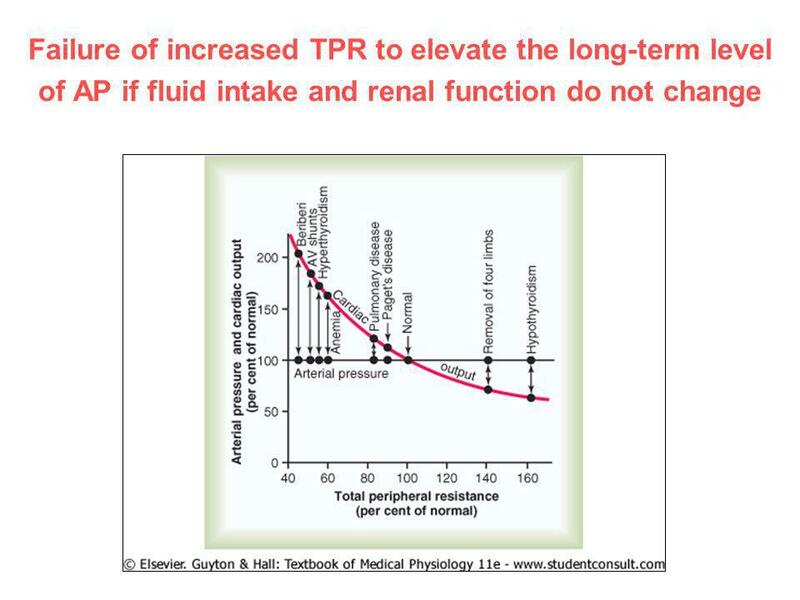 39 Chemoreceptors Chemoreceptors monitor local metabolite levels, which reflect adequacy of perfusion pressure and flow. 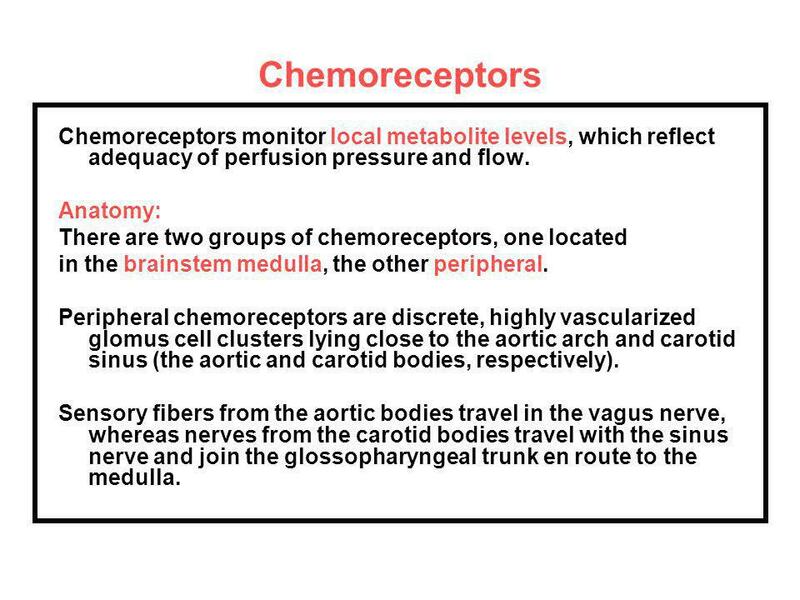 Anatomy: There are two groups of chemoreceptors, one located in the brainstem medulla, the other peripheral. 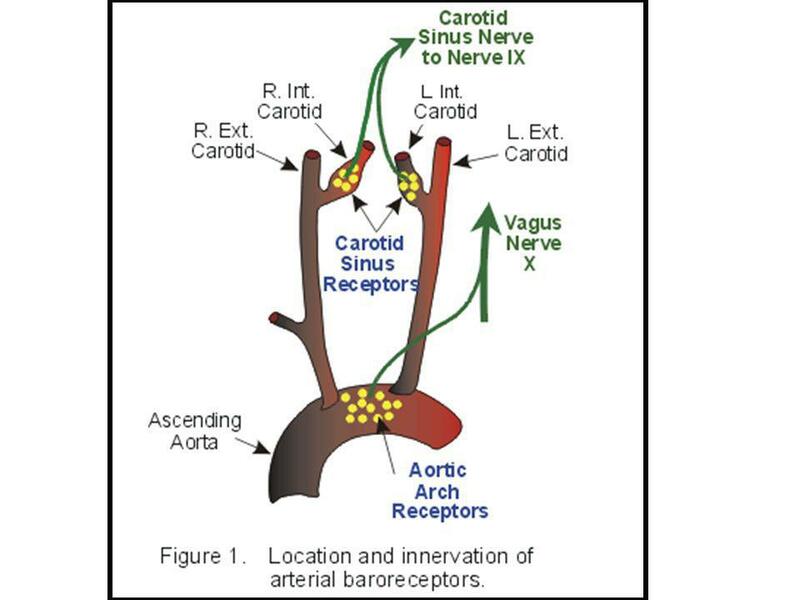 Peripheral chemoreceptors are discrete, highly vascularized glomus cell clusters lying close to the aortic arch and carotid sinus (the aortic and carotid bodies, respectively). 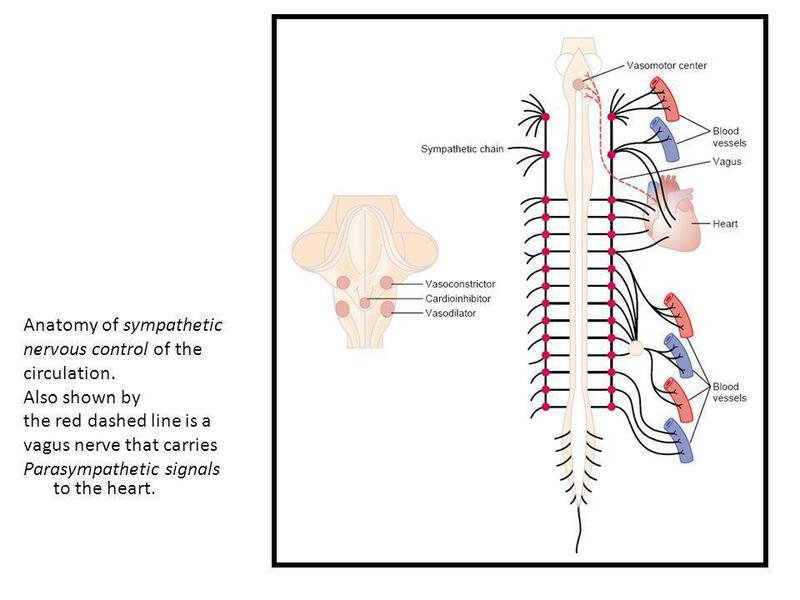 Sensory fibers from the aortic bodies travel in the vagus nerve, whereas nerves from the carotid bodies travel with the sinus nerve and join the glossopharyngeal trunk en route to the medulla. 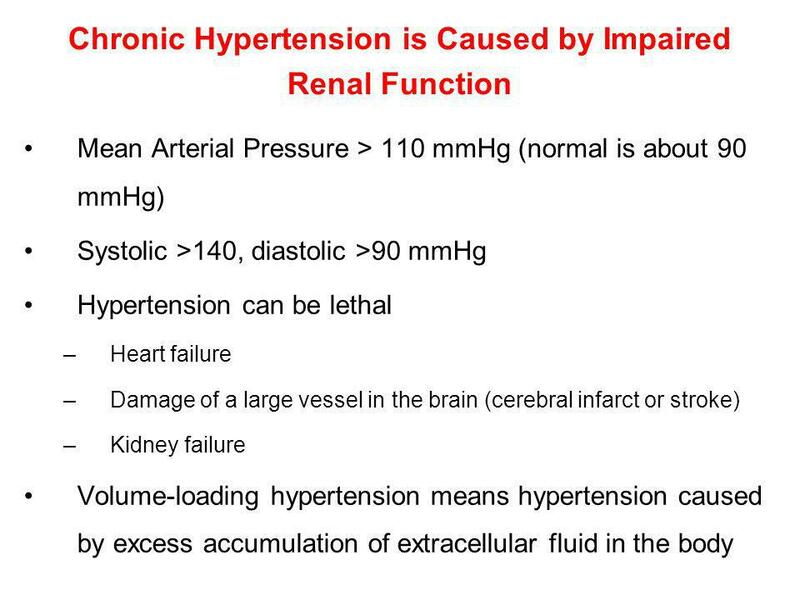 O2 levels fall (60 mm Hg) or when PCO2 or H levels rise (PCO2 40 mm Hg or pH 7.4). 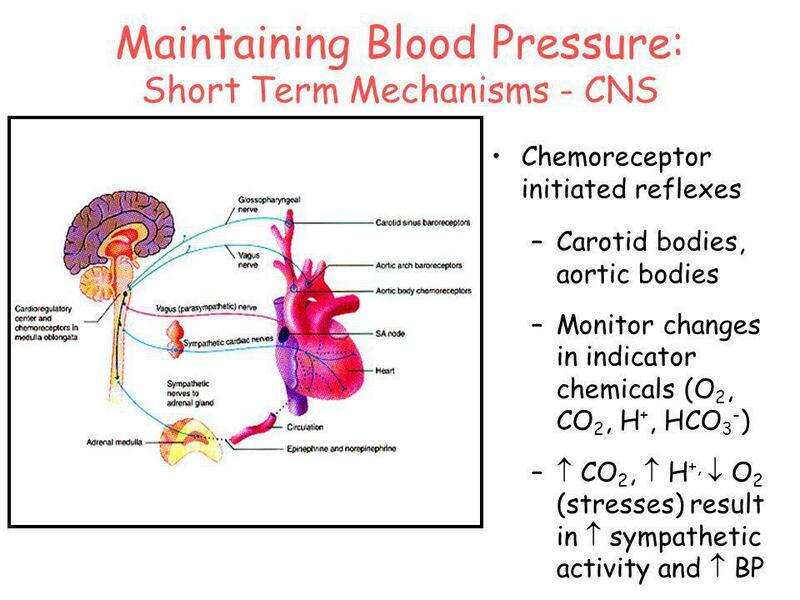 Medullary chemoreceptors are sensitive to the pH of brain interstitial fluid, which is dependent on arterial PCO2. 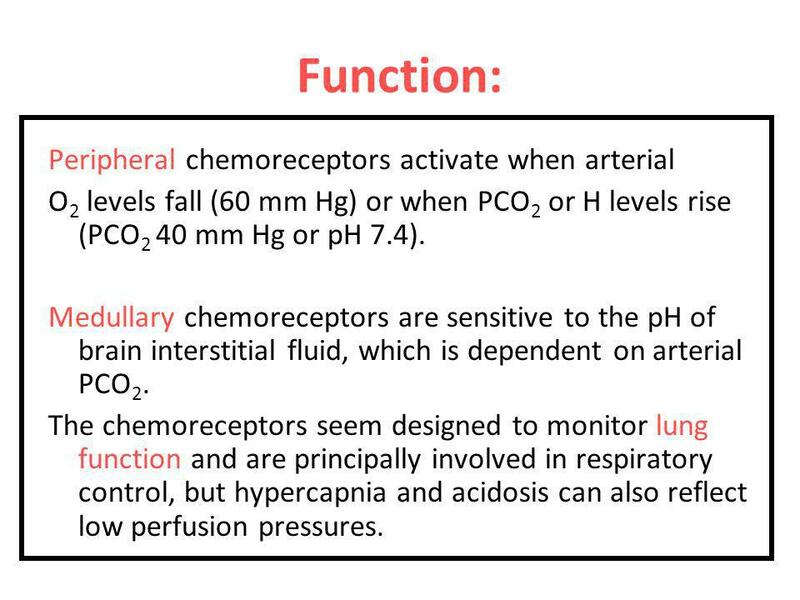 The chemoreceptors seem designed to monitor lung function and are principally involved in respiratory control, but hypercapnia and acidosis can also reflect low perfusion pressures. 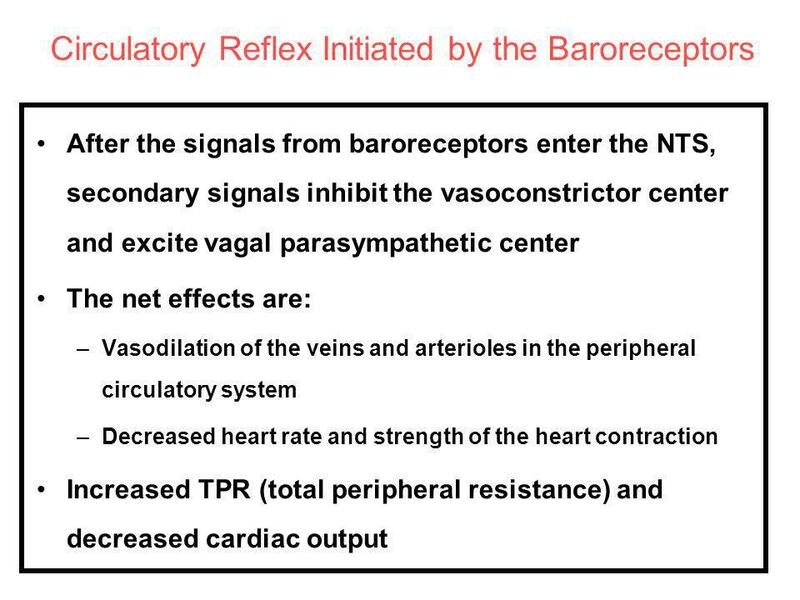 A second set of baroreceptors is found in low-pressure regions of the cardiovascular system. 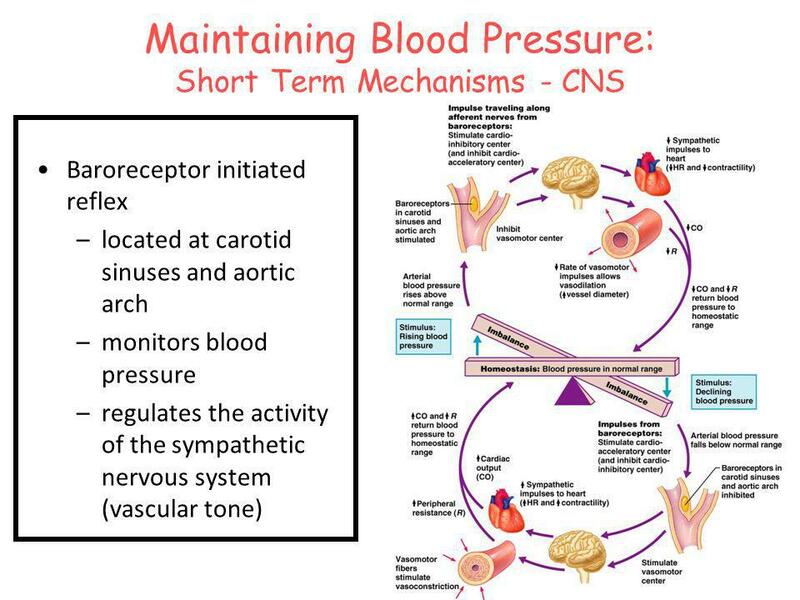 They provide the CNS with information about the “fullness” of the vascular system, and their principal role is in modulating renal function. 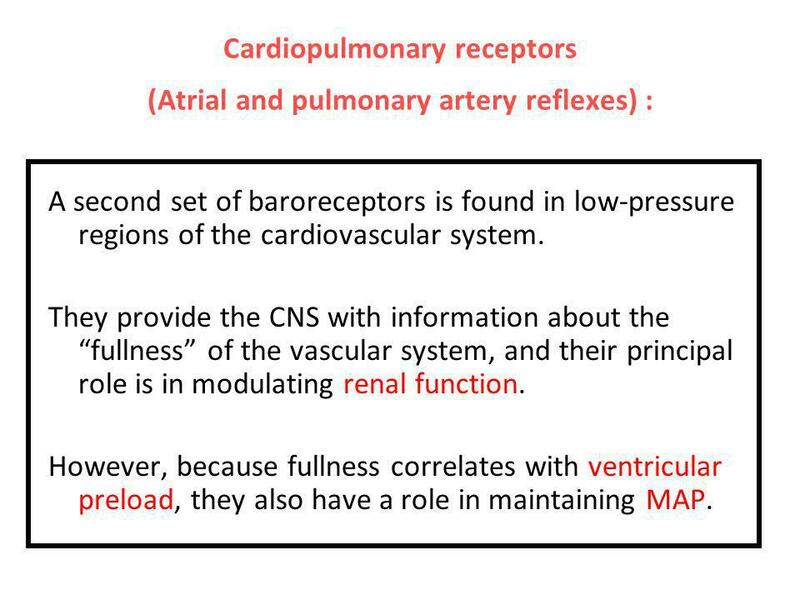 However, because fullness correlates with ventricular preload, they also have a role in maintaining MAP. 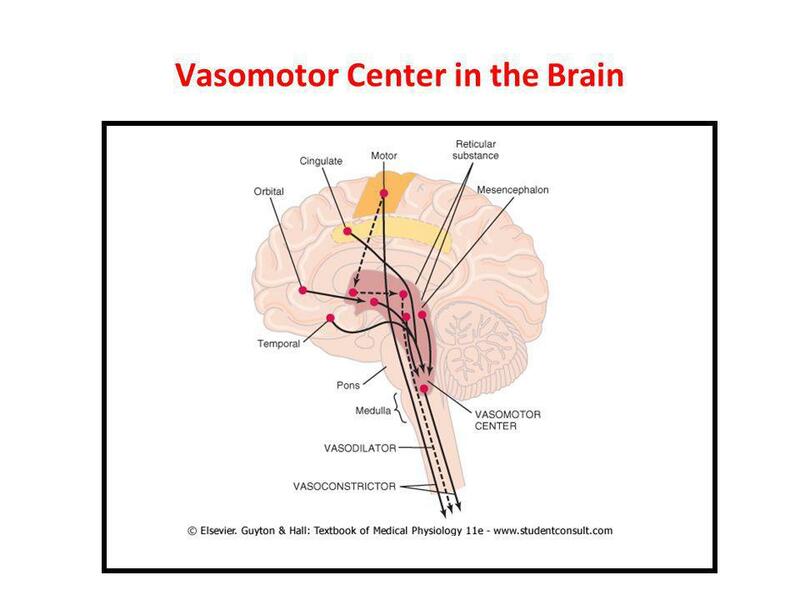 45 Anatomy: The receptors are similar to those found in the arterial system: bare sensory nerve endings embedded in walls of the vena cavae, the pulmonary artery and vein, and the atria. 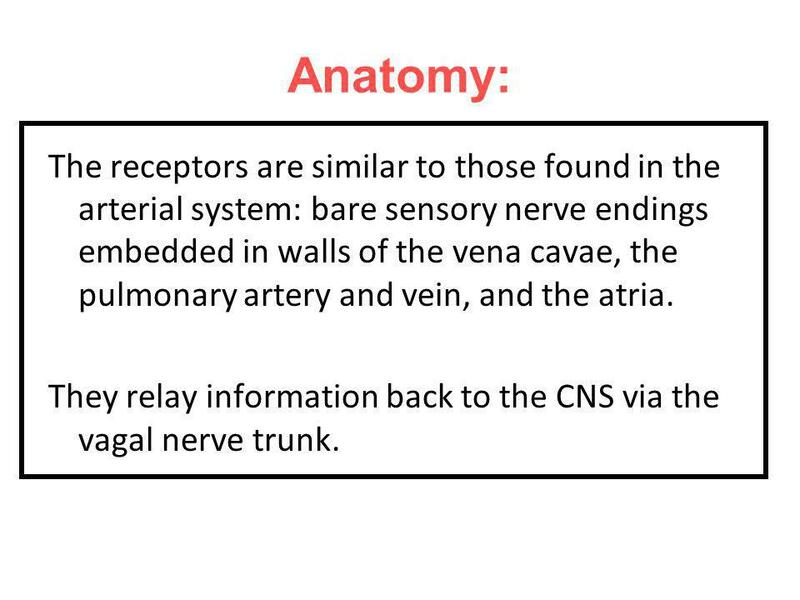 They relay information back to the CNS via the vagal nerve trunk. 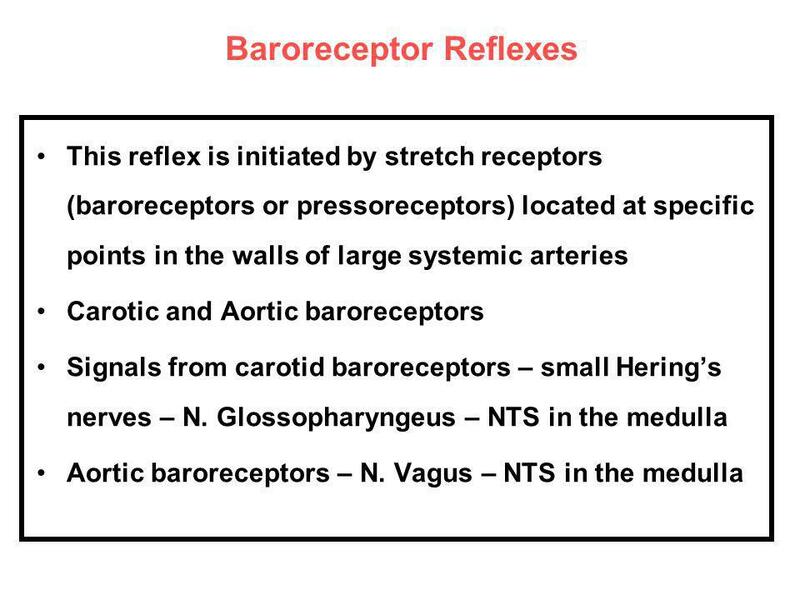 baroreceptors. 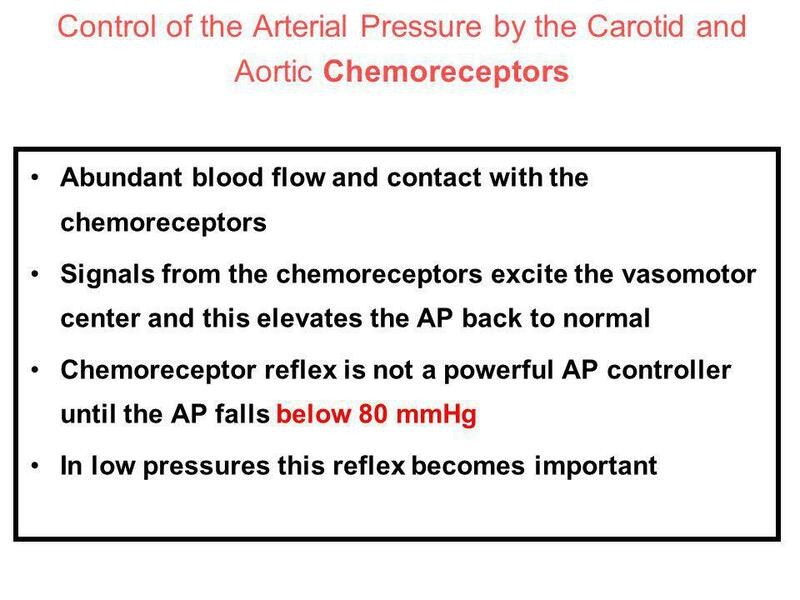 A receptors respond to tension that develops in the atrial wall during contraction. 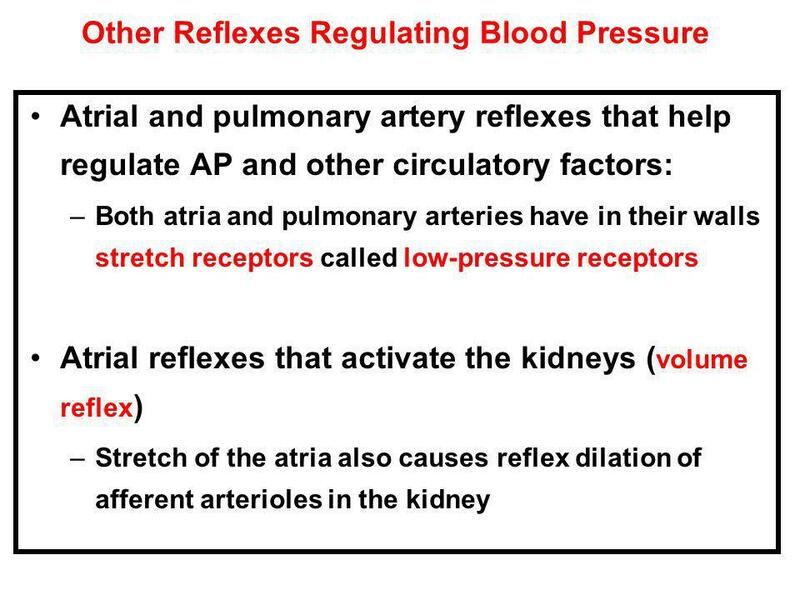 B receptors are sensitive to atrial wall stretching during filling. 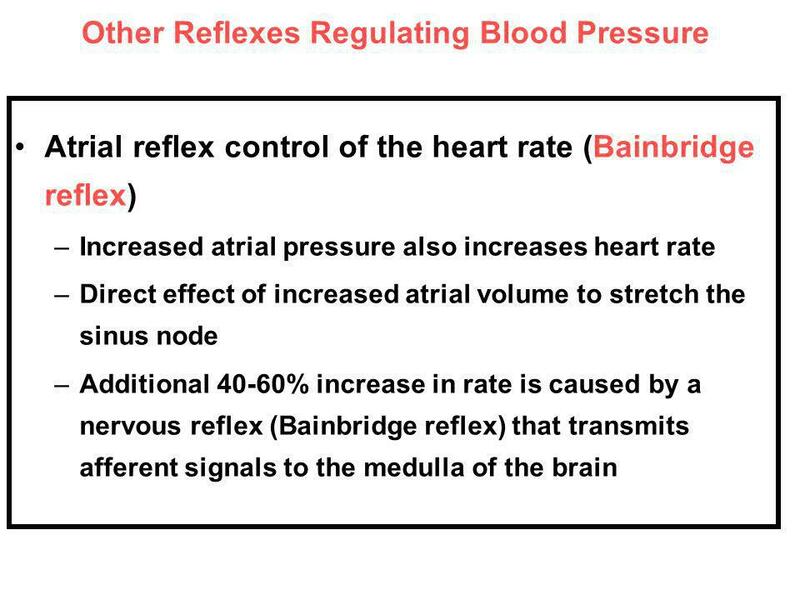 B receptors are also involved in raising HR when central venous pressure (CVP) is high, a response known as the Bainbridge reflex. 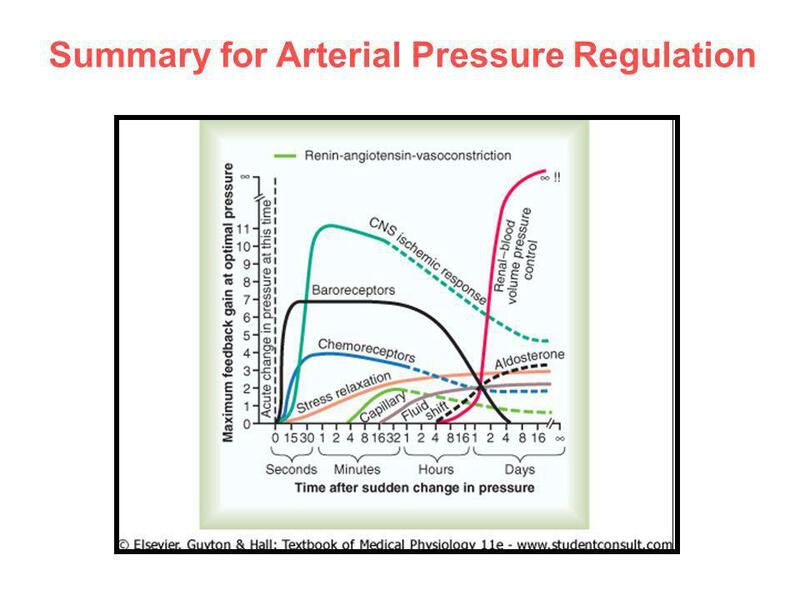 A drop in arterial pressure activates the baroreceptor reflex , but it also initiates pathways that require 24–48 hr to become fully effective. 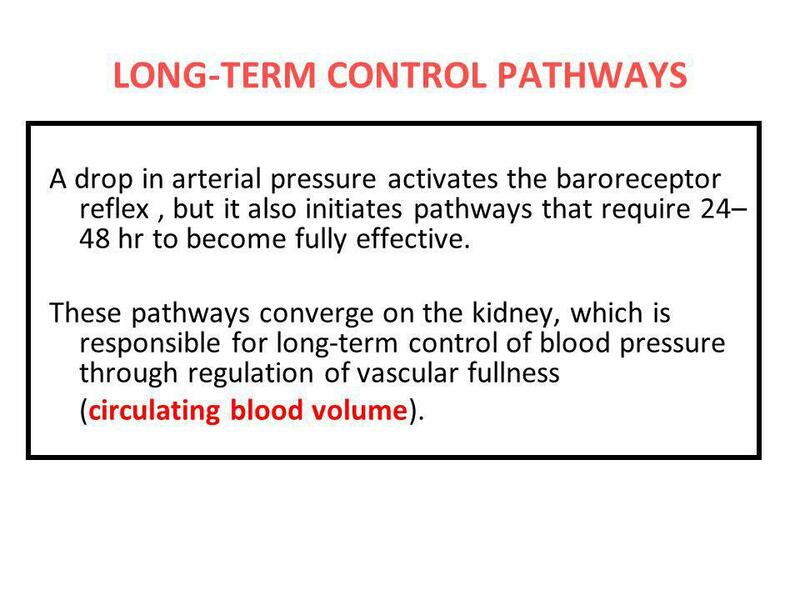 These pathways converge on the kidney, which is responsible for long-term control of blood pressure through regulation of vascular fullness (circulating blood volume). 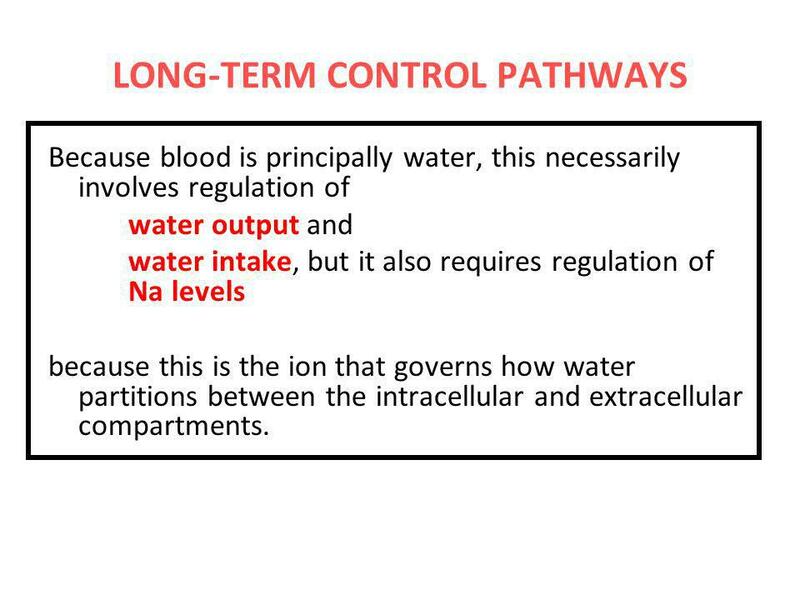 Because blood is principally water, this necessarily involves regulation of water output and water intake, but it also requires regulation of Na levels because this is the ion that governs how water partitions between the intracellular and extracellular compartments. 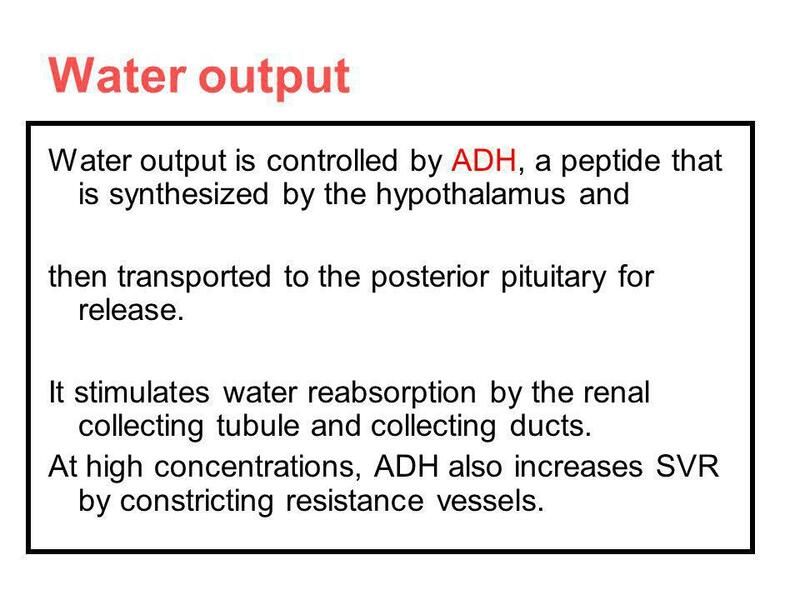 55 Water output Water output is controlled by ADH, a peptide that is synthesized by the hypothalamus and then transported to the posterior pituitary for release. 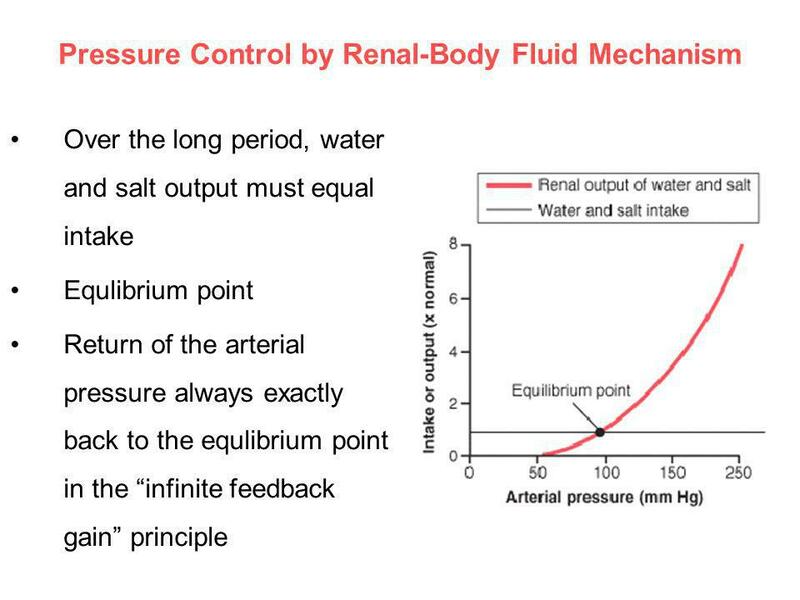 It stimulates water reabsorption by the renal collecting tubule and collecting ducts. 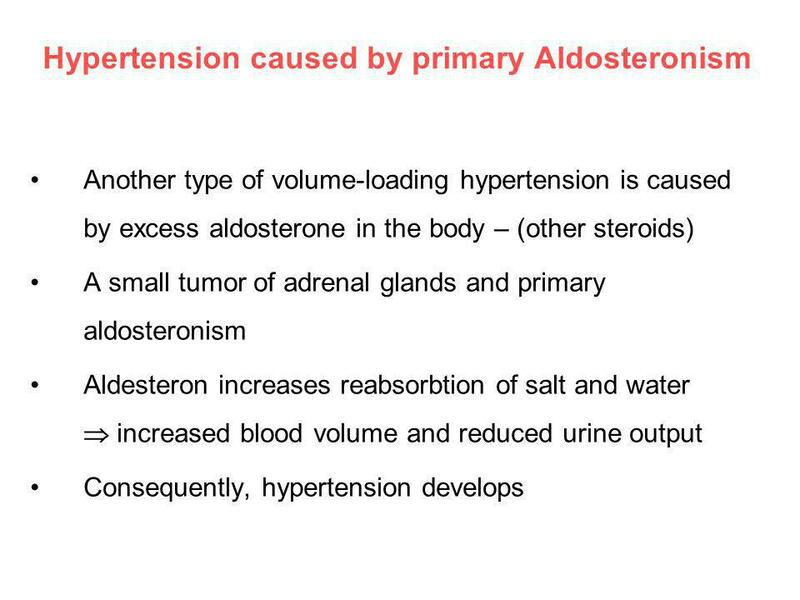 At high concentrations, ADH also increases SVR by constricting resistance vessels. 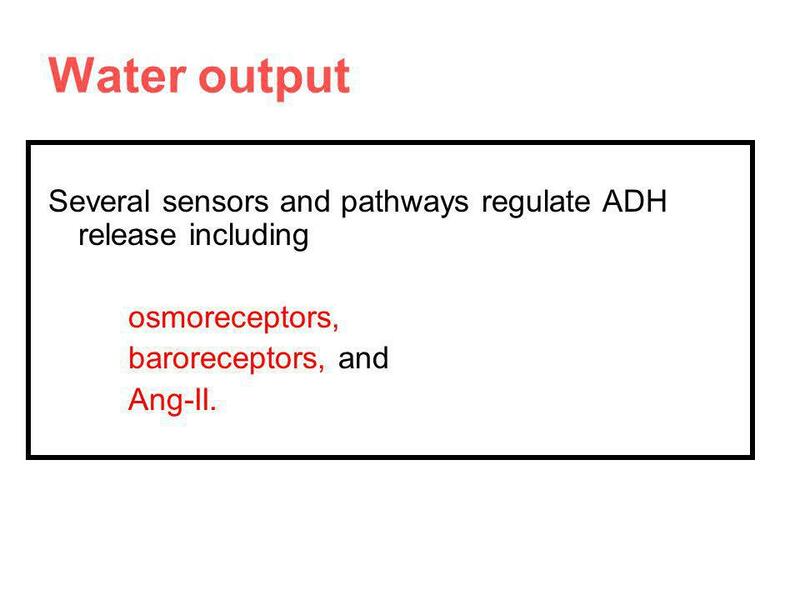 56 Water output Several sensors and pathways regulate ADH release including osmoreceptors, baroreceptors, and Ang-II. 57 1. 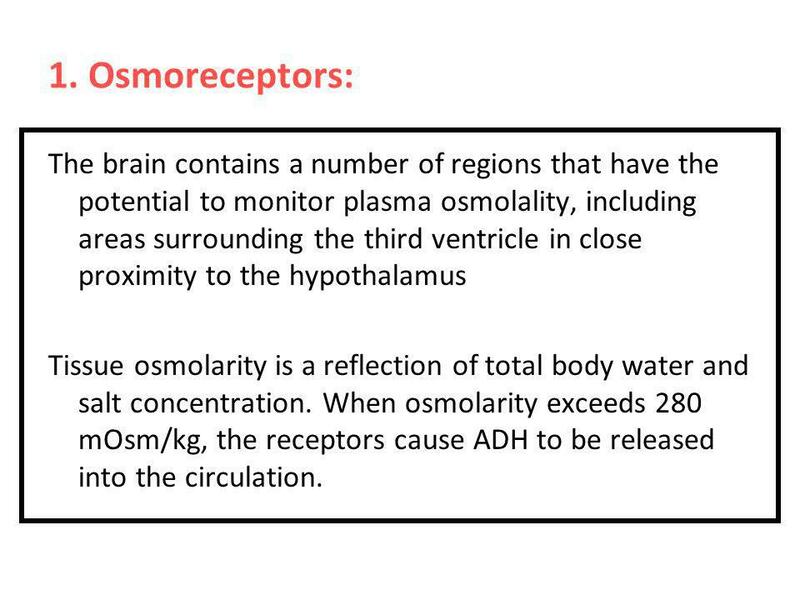 Osmoreceptors: The brain contains a number of regions that have the potential to monitor plasma osmolality, including areas surrounding the third ventricle in close proximity to the hypothalamus Tissue osmolarity is a reflection of total body water and salt concentration. 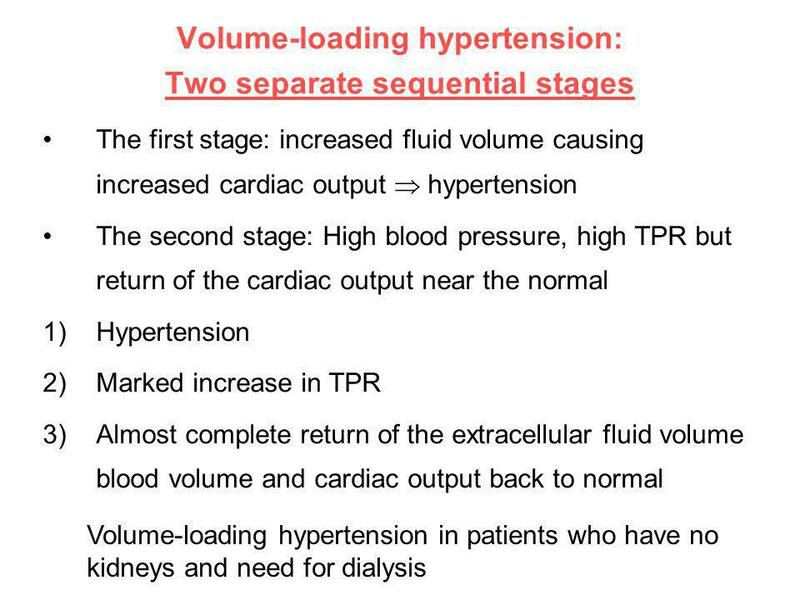 When osmolarity exceeds 280 mOsm/kg, the receptors cause ADH to be released into the circulation. 58 2. 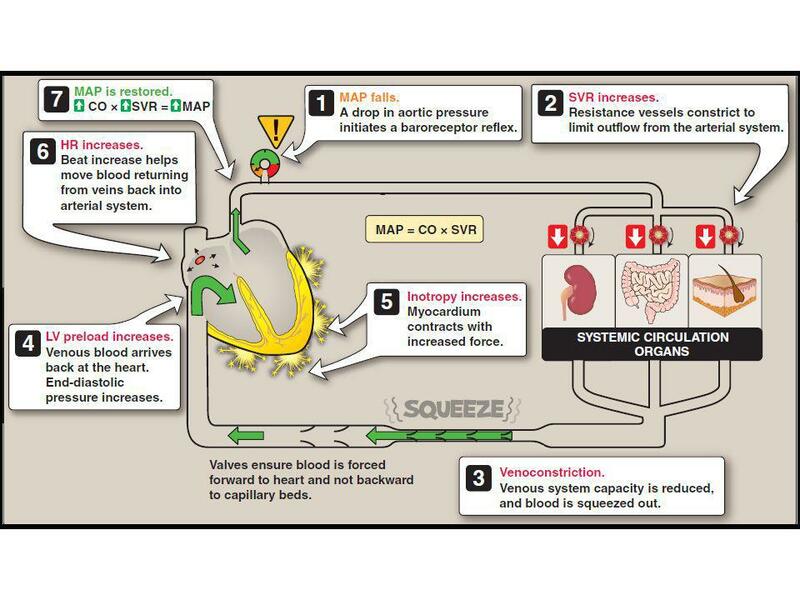 Baroreceptors: A decrease in circulating blood volume causes CVP to fall, which is sensed by the cardiopulmonary receptors. 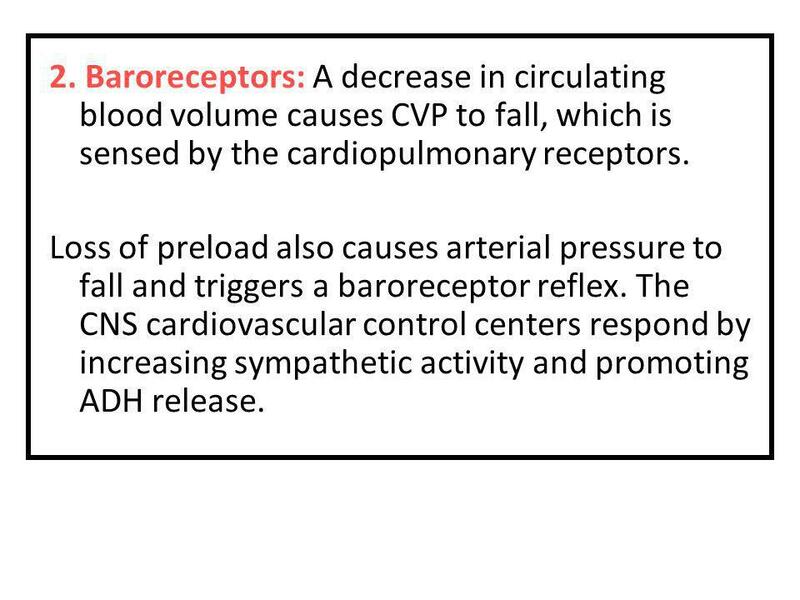 Loss of preload also causes arterial pressure to fall and triggers a baroreceptor reflex. 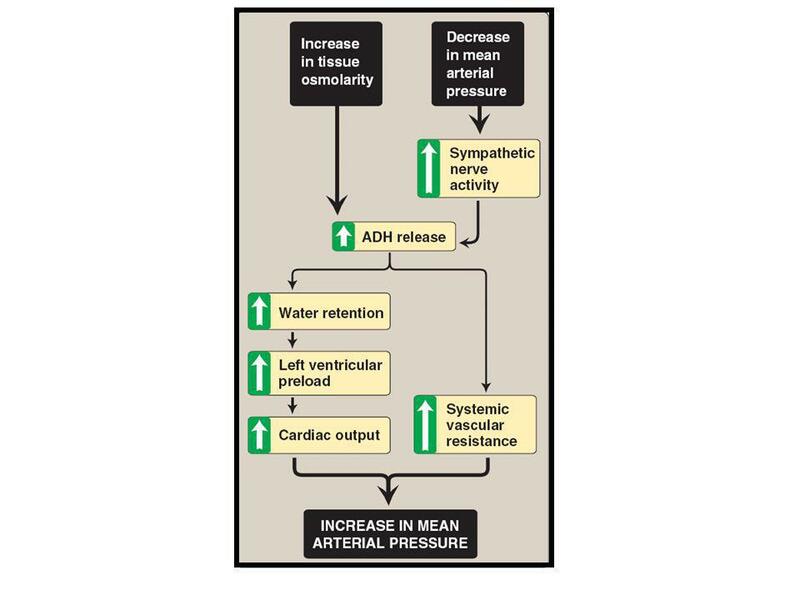 The CNS cardiovascular control centers respond by increasing sympathetic activity and promoting ADH release. 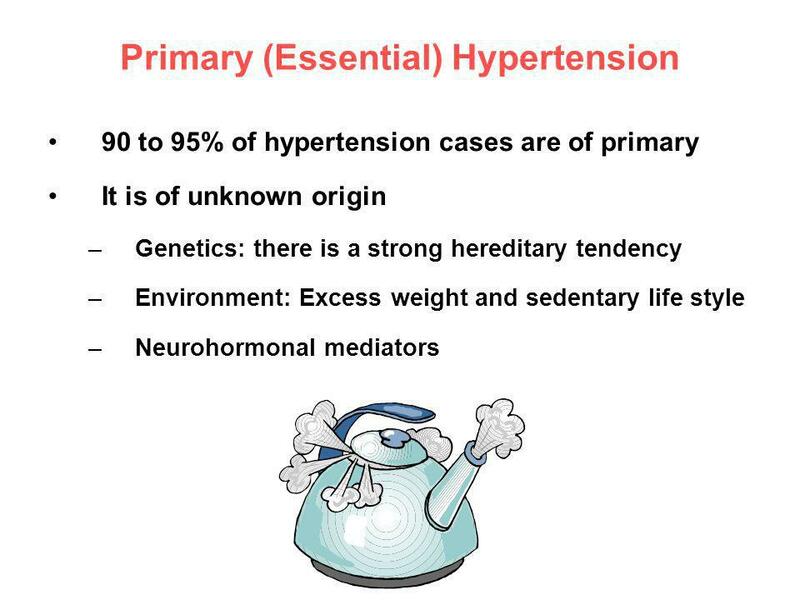 59 3. 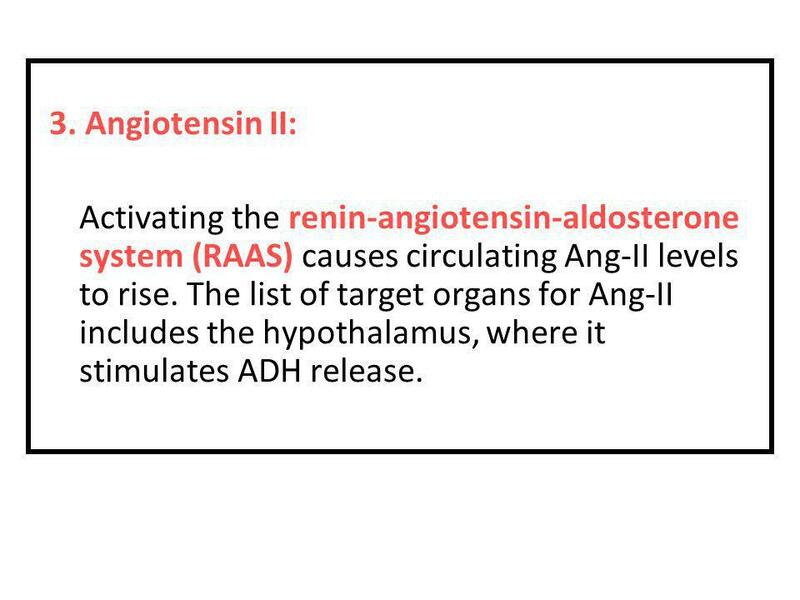 Angiotensin II: Activating the renin-angiotensin-aldosterone system (RAAS) causes circulating Ang-II levels to rise. 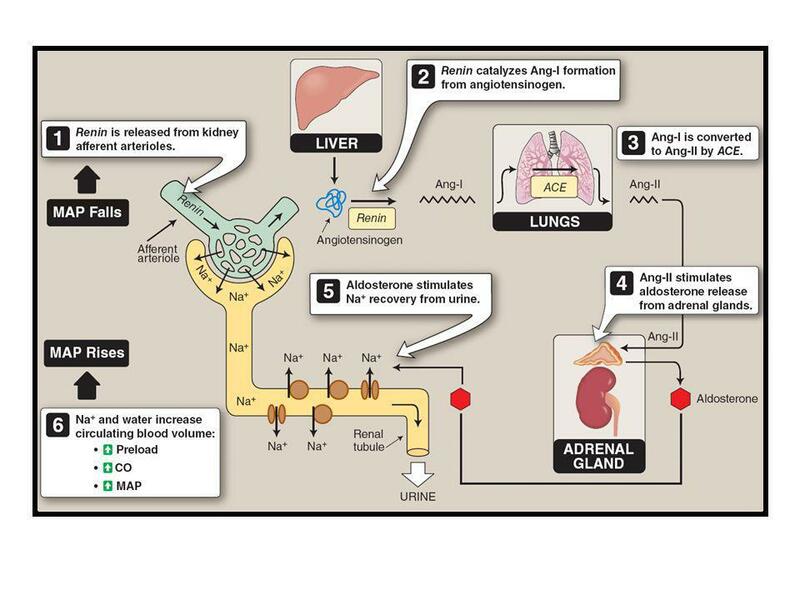 The list of target organs for Ang-II includes the hypothalamus, where it stimulates ADH release. 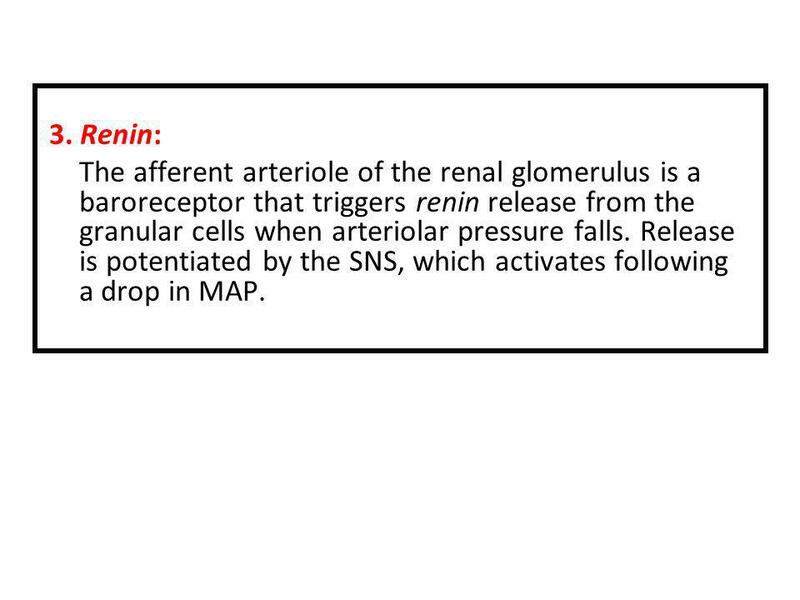 Renin is a proteolytic enzyme synthesized by granular cells in the wall of glomerular afferent arterioles. 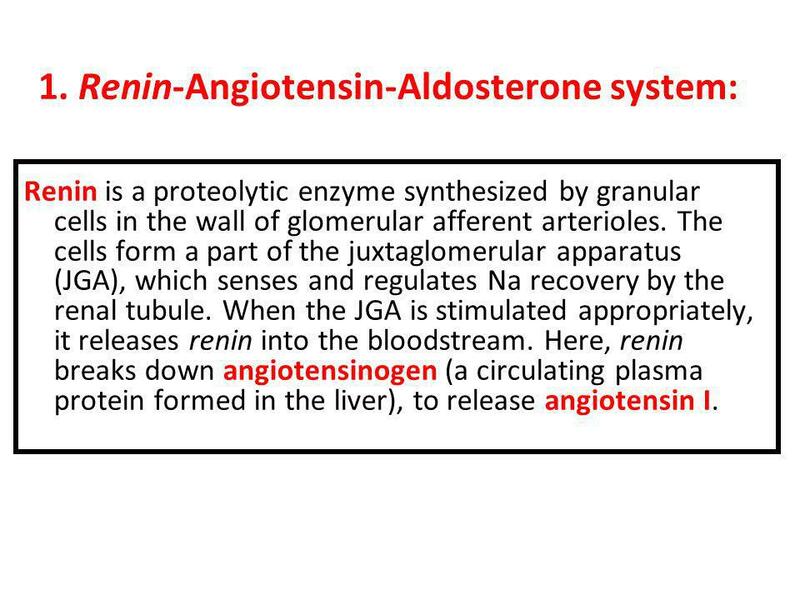 The cells form a part of the juxtaglomerular apparatus (JGA), which senses and regulates Na recovery by the renal tubule. 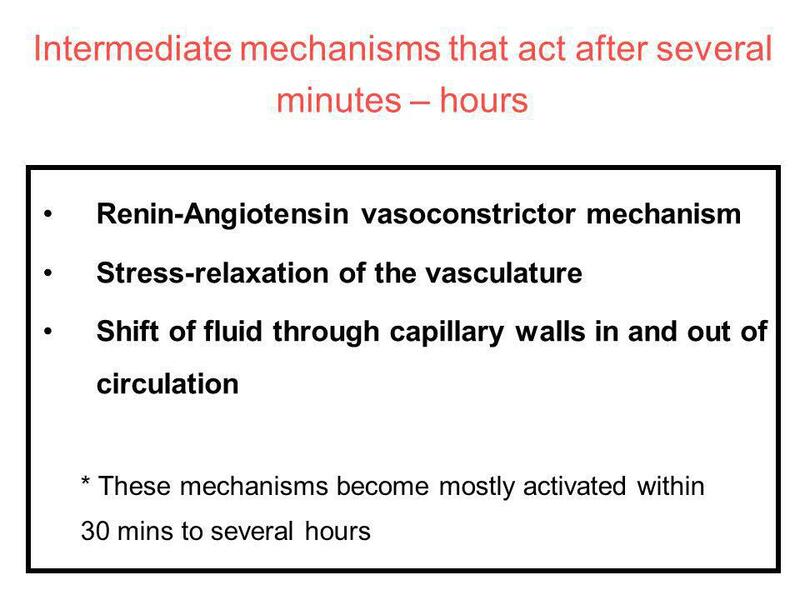 When the JGA is stimulated appropriately, it releases renin into the bloodstream. 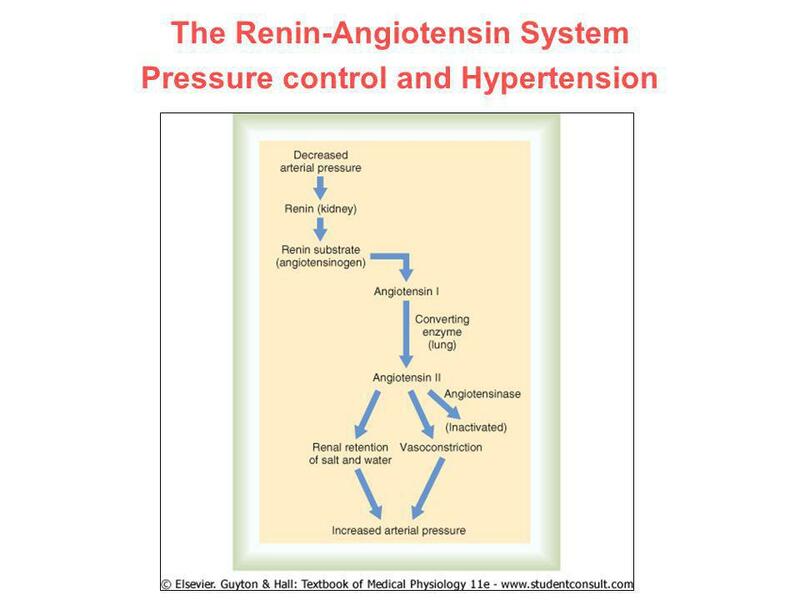 Here, renin breaks down angiotensinogen (a circulating plasma protein formed in the liver), to release angiotensin I. 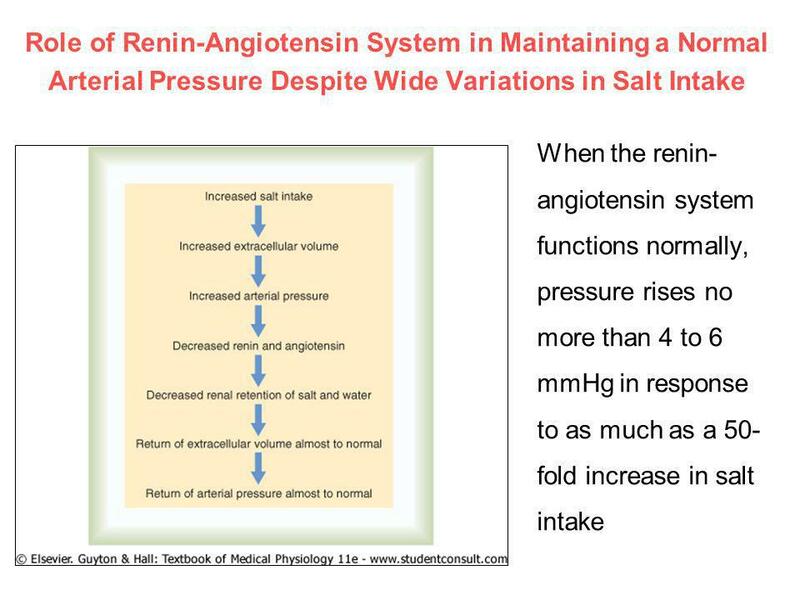 The latter serves as a substrate for angiotensin-converting enzyme (ACE). 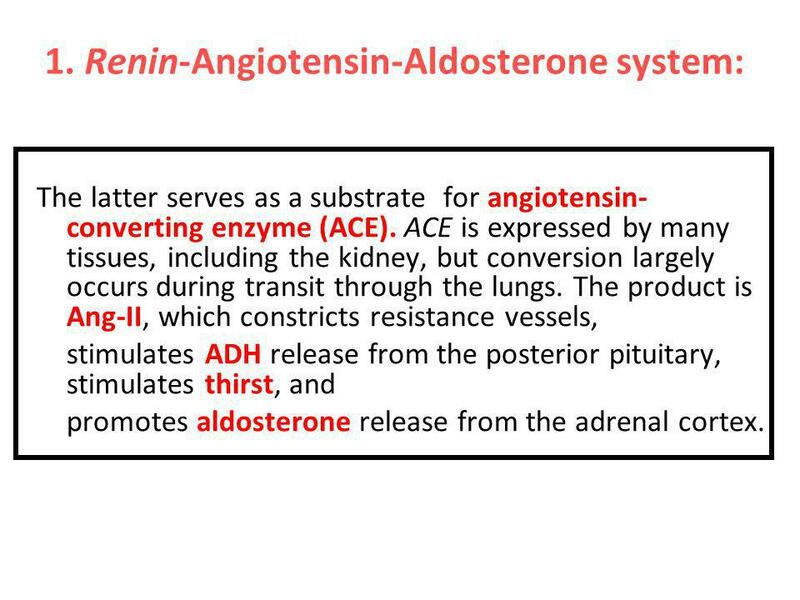 ACE is expressed by many tissues, including the kidney, but conversion largely occurs during transit through the lungs. 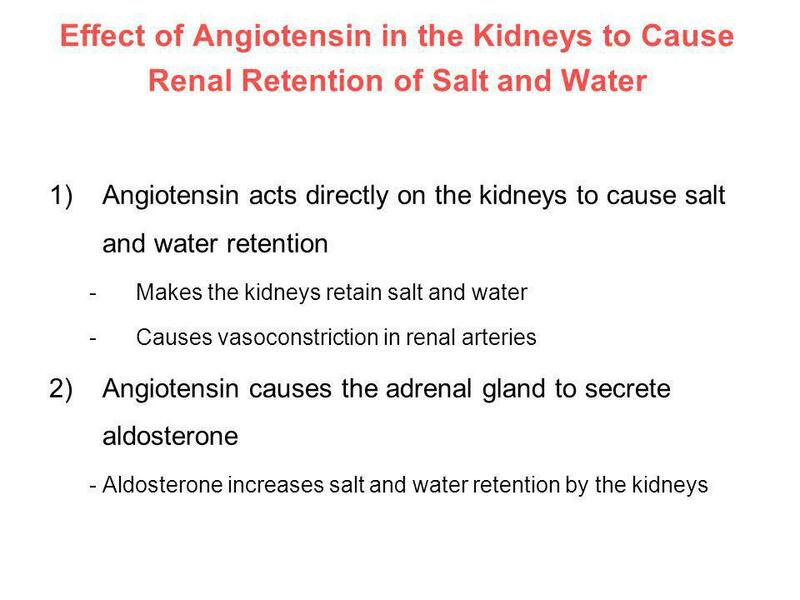 The product is Ang-II, which constricts resistance vessels, stimulates ADH release from the posterior pituitary, stimulates thirst, and promotes aldosterone release from the adrenal cortex. 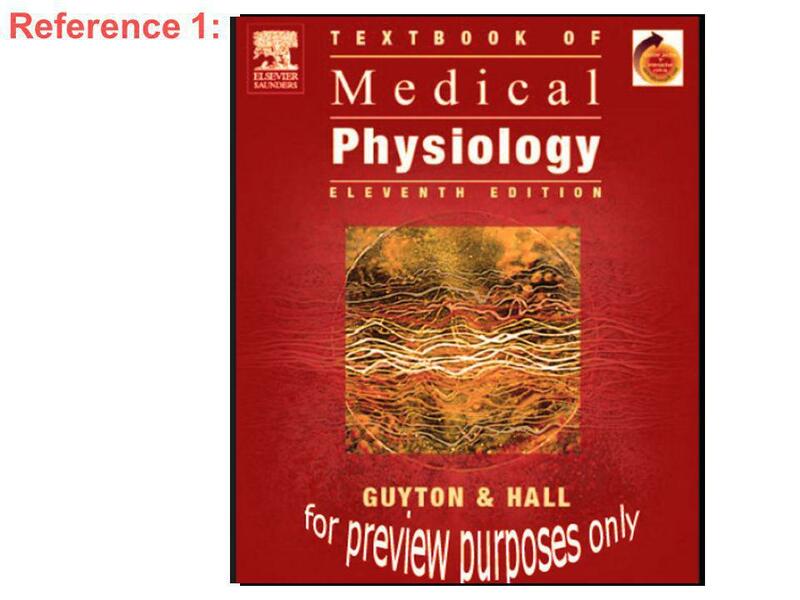 collecting tubule epithelium. 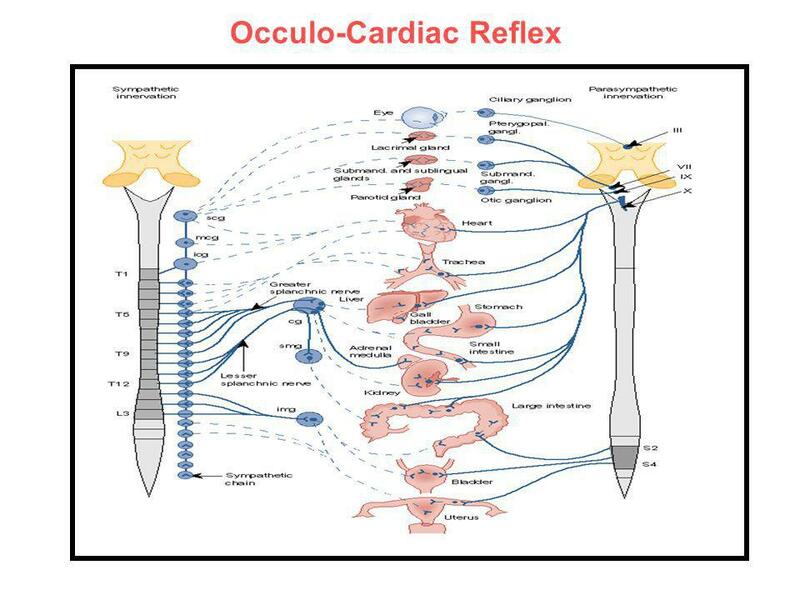 It has multiple actions, all of which promote recovery of Na and osmotically obligated water from the tubule. 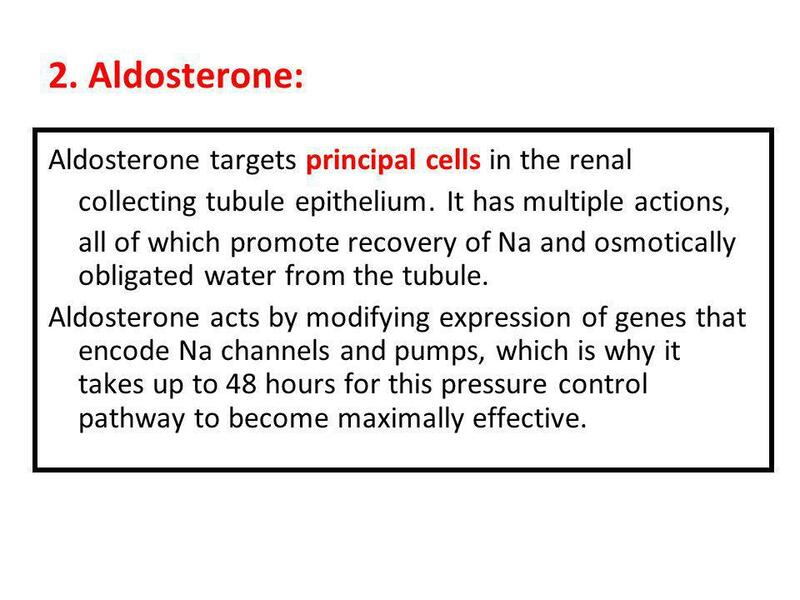 Aldosterone acts by modifying expression of genes that encode Na channels and pumps, which is why it takes up to 48 hours for this pressure control pathway to become maximally effective. 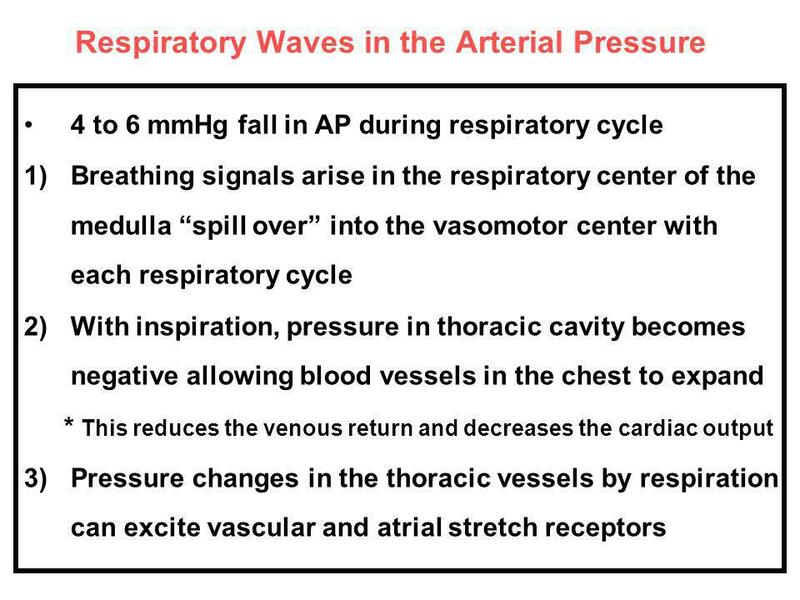 65 3. 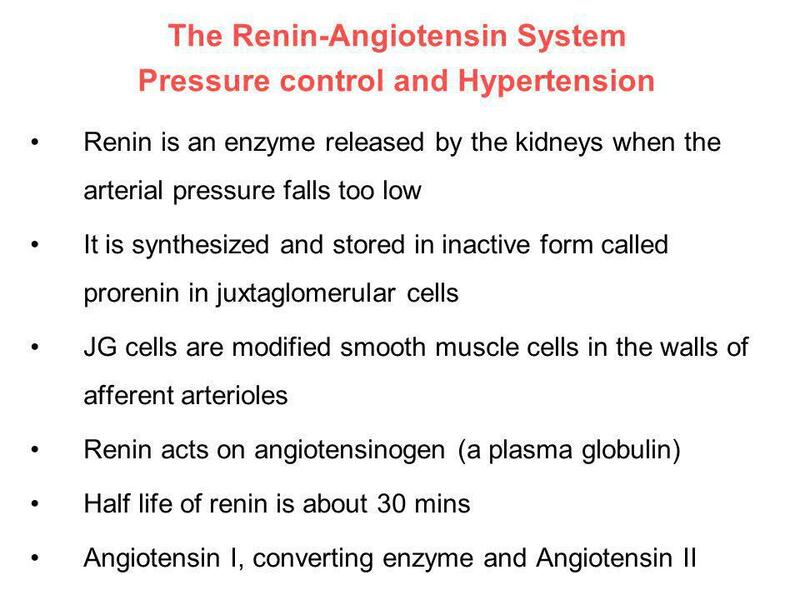 Renin: The afferent arteriole of the renal glomerulus is a baroreceptor that triggers renin release from the granular cells when arteriolar pressure falls. 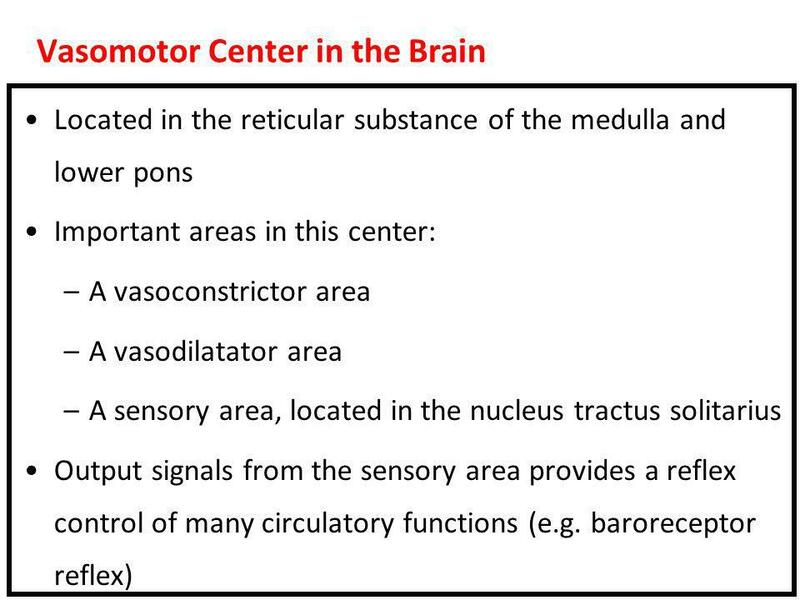 Release is potentiated by the SNS, which activates following a drop in MAP. 67 4. 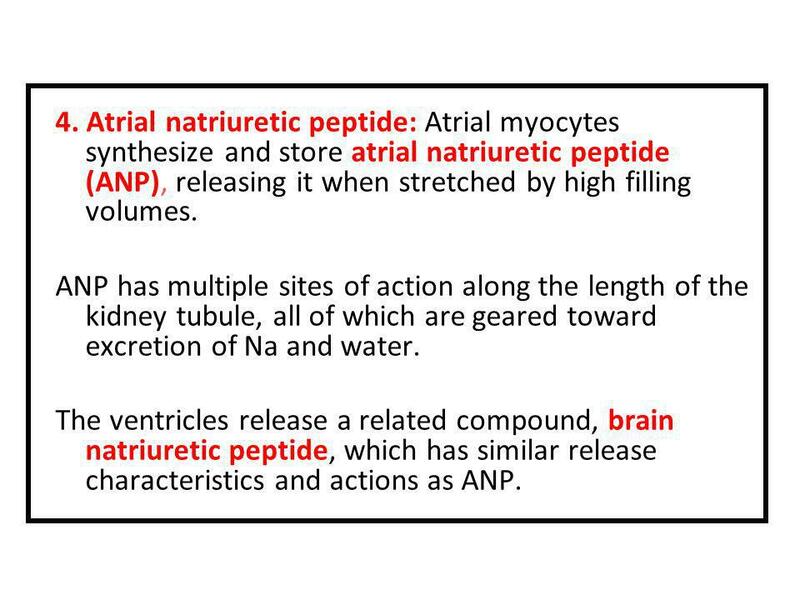 Atrial natriuretic peptide: Atrial myocytes synthesize and store atrial natriuretic peptide (ANP), releasing it when stretched by high filling volumes. 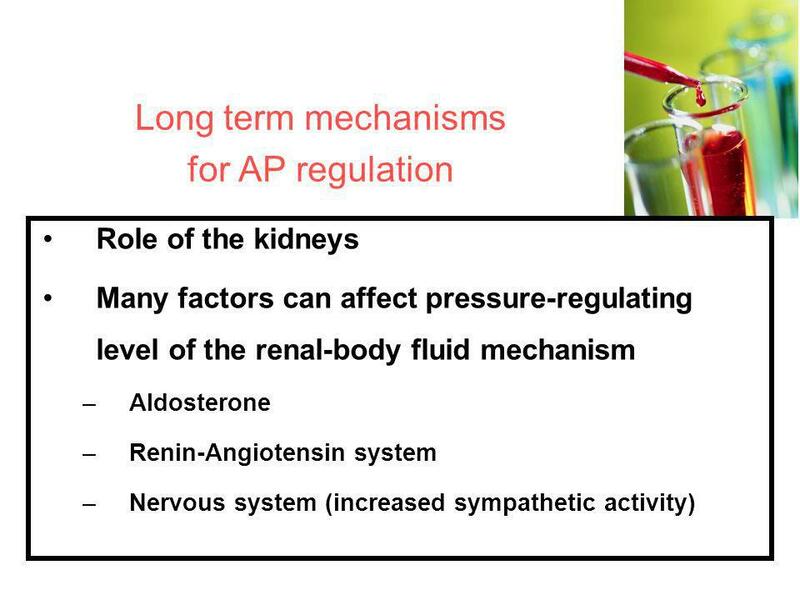 ANP has multiple sites of action along the length of the kidney tubule, all of which are geared toward excretion of Na and water. 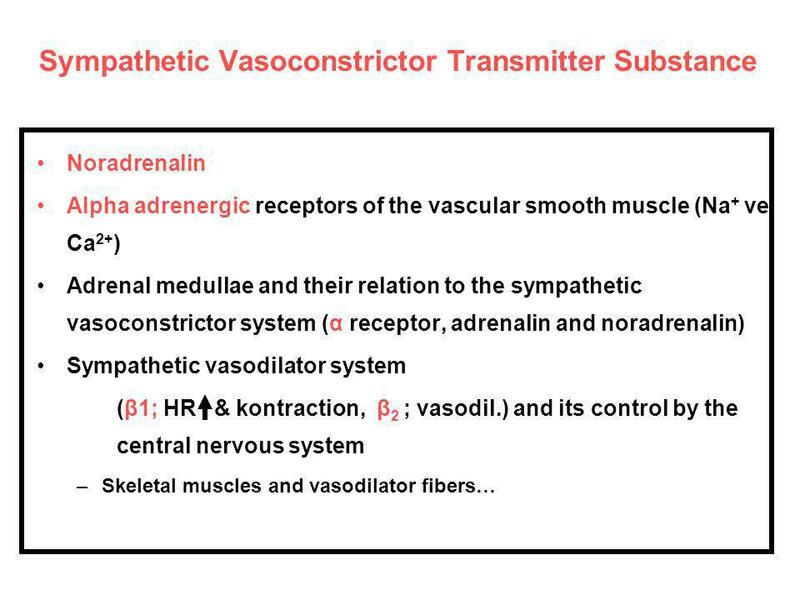 The ventricles release a related compound, brain natriuretic peptide, which has similar release characteristics and actions as ANP. 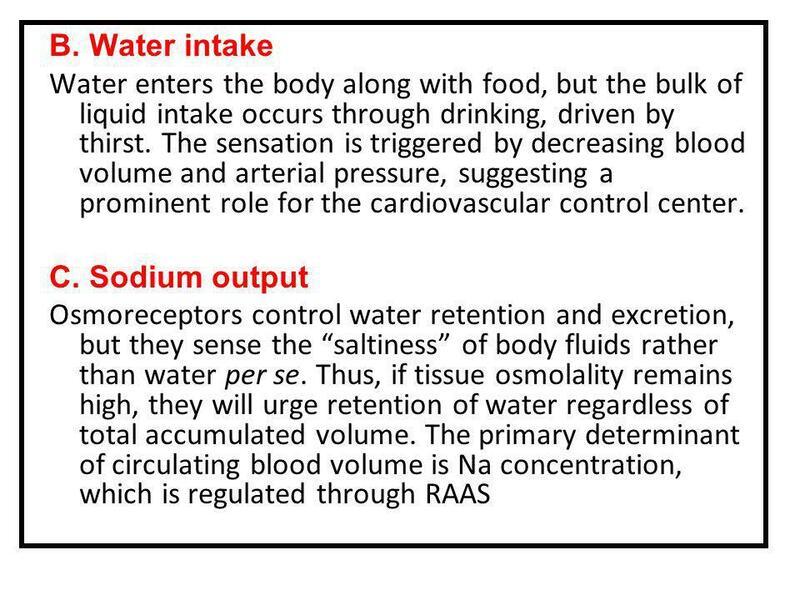 68 D. Sodium intake Just as thirst stimulates water intake, salt craving triggers a need to ingest NaCl. 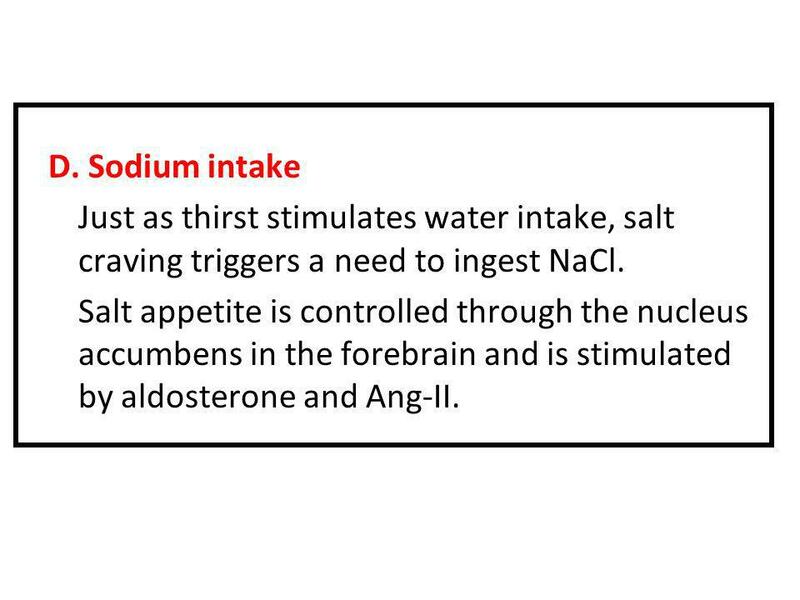 Salt appetite is controlled through the nucleus accumbens in the forebrain and is stimulated by aldosterone and Ang-II. 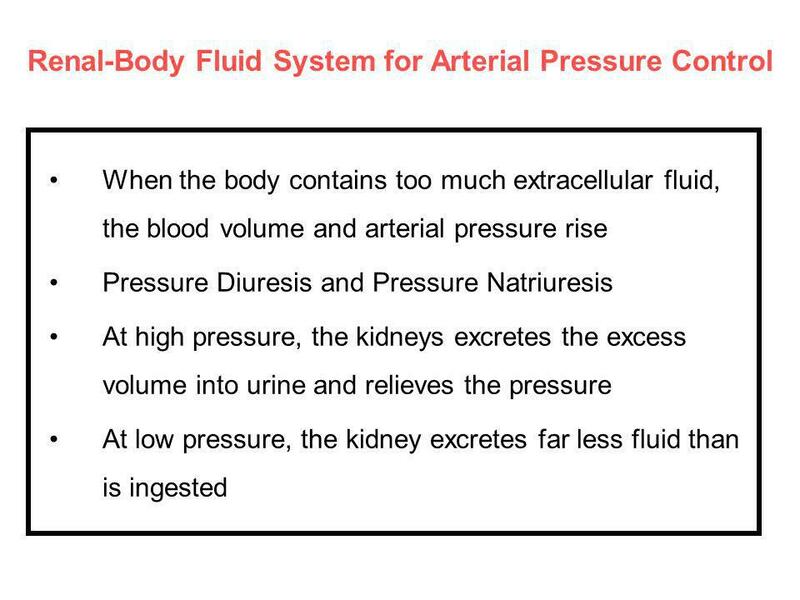 69 Pressure Natriuresis. 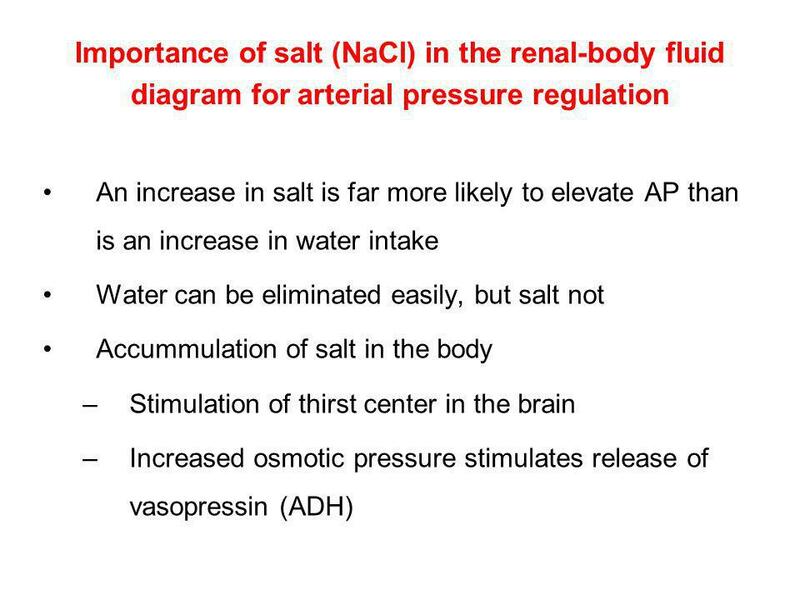 Arterial pressure is a signal for regulation of NaCl excretion. 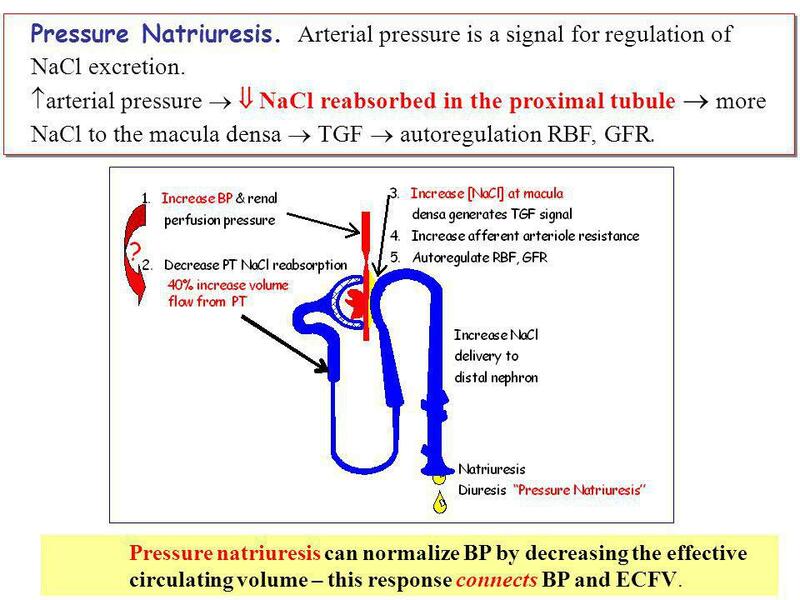 arterial pressure   NaCl reabsorbed in the proximal tubule  more NaCl to the macula densa  TGF  autoregulation RBF, GFR. 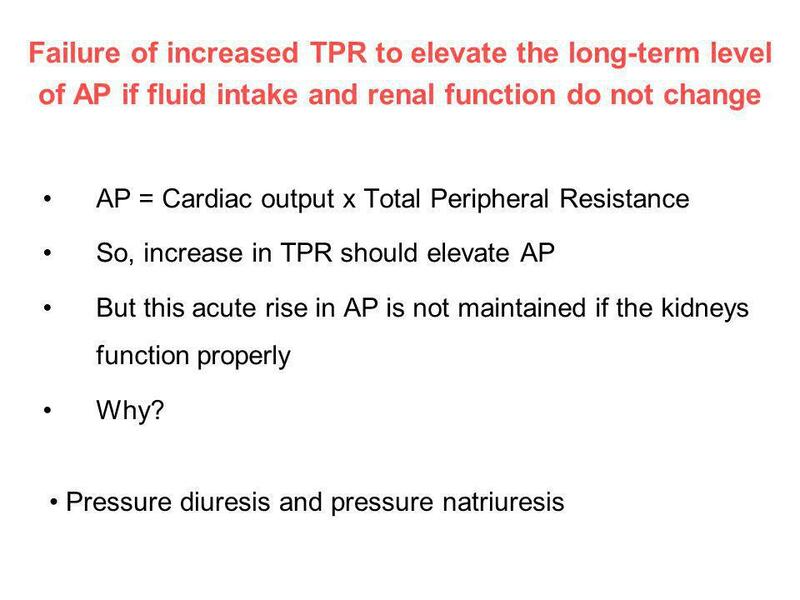 Pressure natriuresis can normalize BP by decreasing the effective circulating volume – this response connects BP and ECFV. 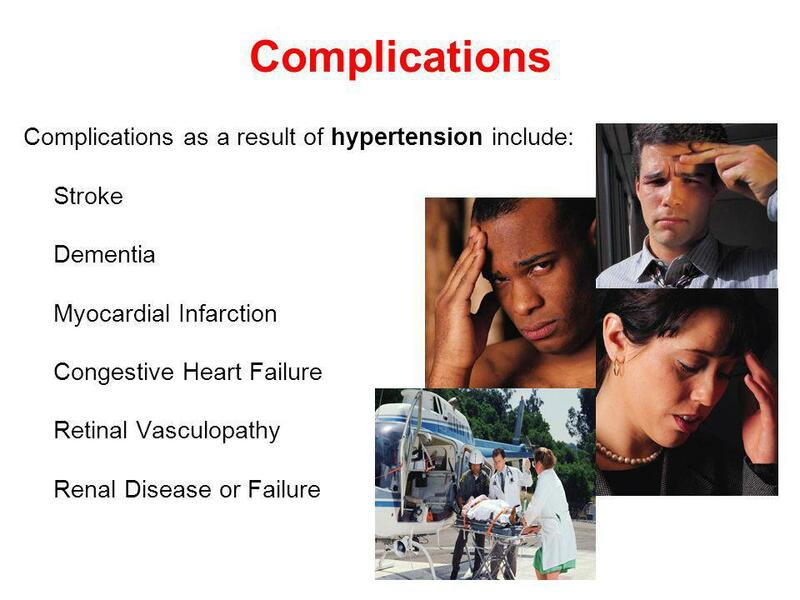 Stroke Dementia Myocardial Infarction Congestive Heart Failure Retinal Vasculopathy Renal Disease or Failure Slide #18: Untreated, resistant or uncontrolled hypertension can result in these complications. 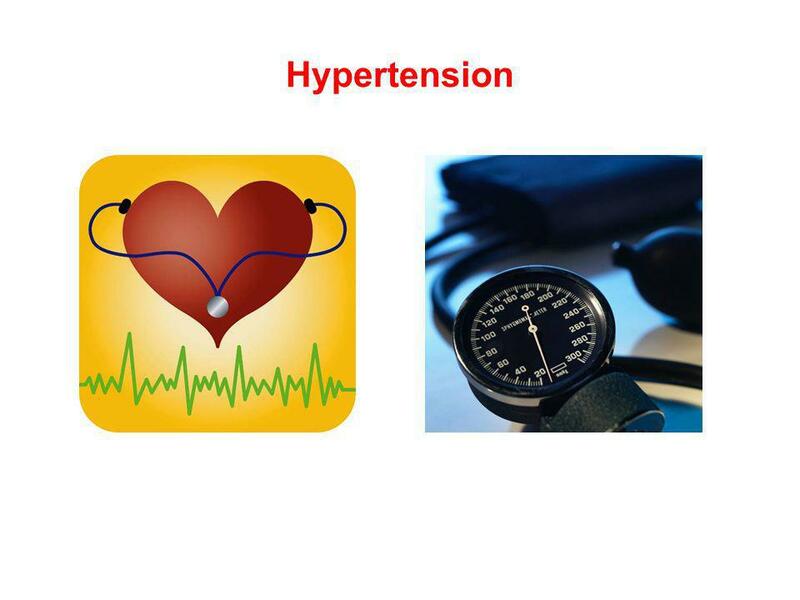 Mild hypertension left untreated can progress into severe or malignant hypertension. 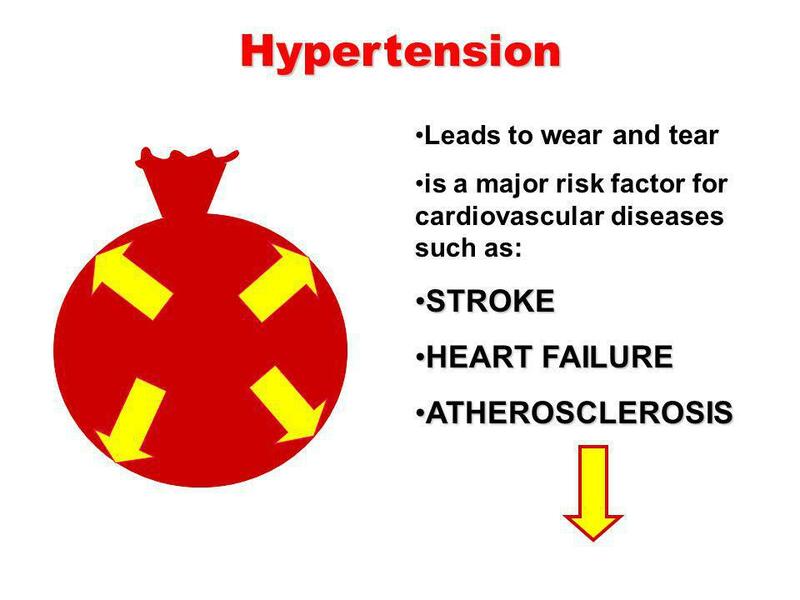 Hypertension is usually asymptomatic until it reaches severe stages (Brashers, 2006). 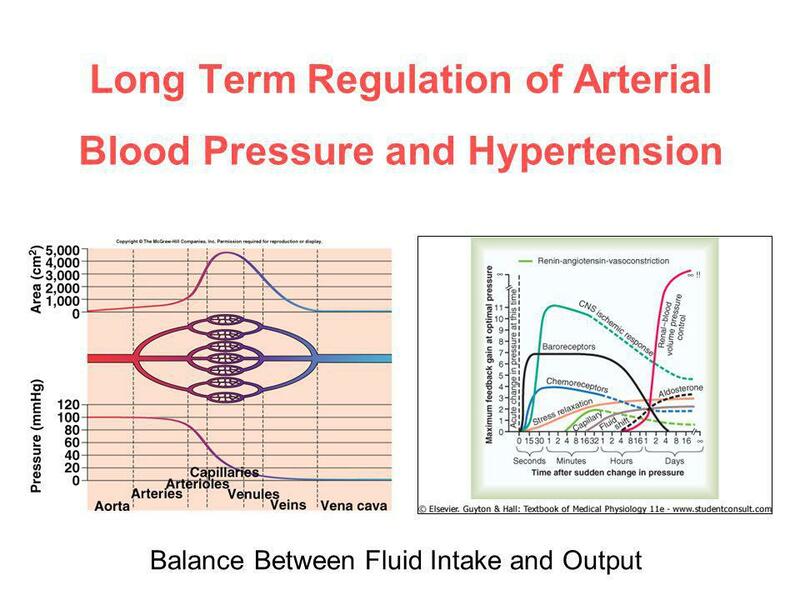 Download ppt "Regulation of Blood Pressure"
Lecture 5 Regulation of Sodium and Water Excretion ….. essentially same as….. 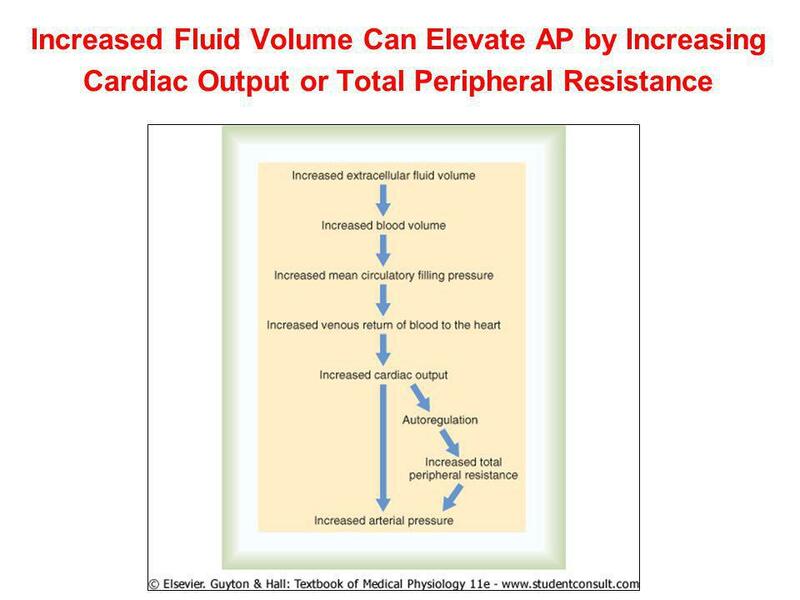 Regulating Plasma Volume and Osmolarity. 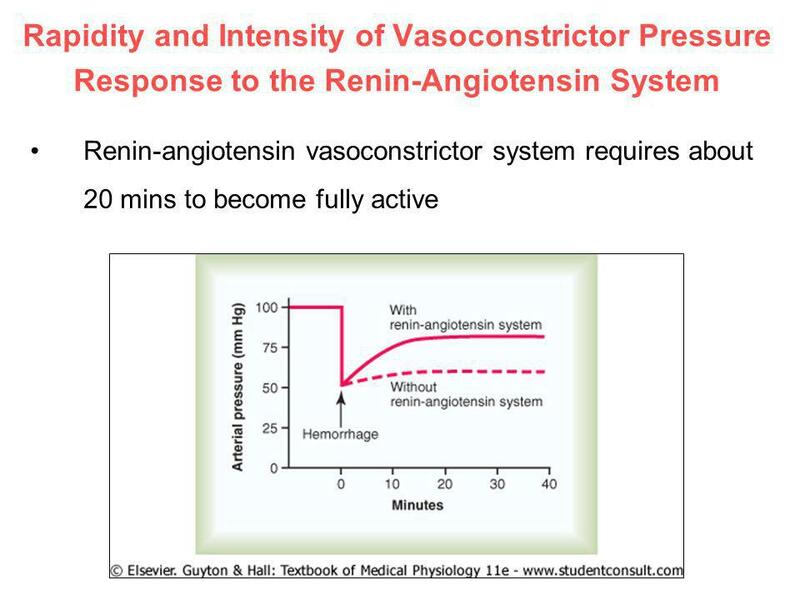 ARTERIAL PRESSURE CONTROL CHAPTER III: ARTERIAL PRESSURE CONTROL Asst. 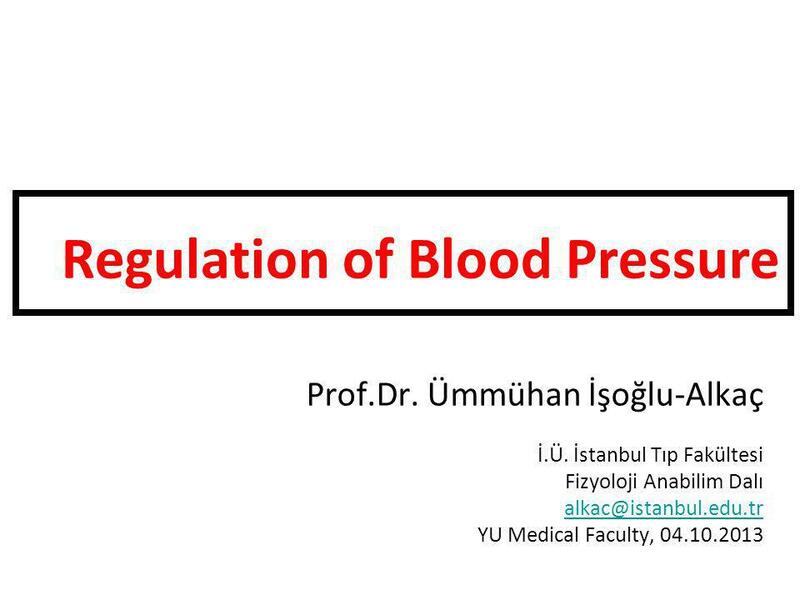 Prof. Dr. Emre Hamurtekin EMU Faculty of Pharmacy. 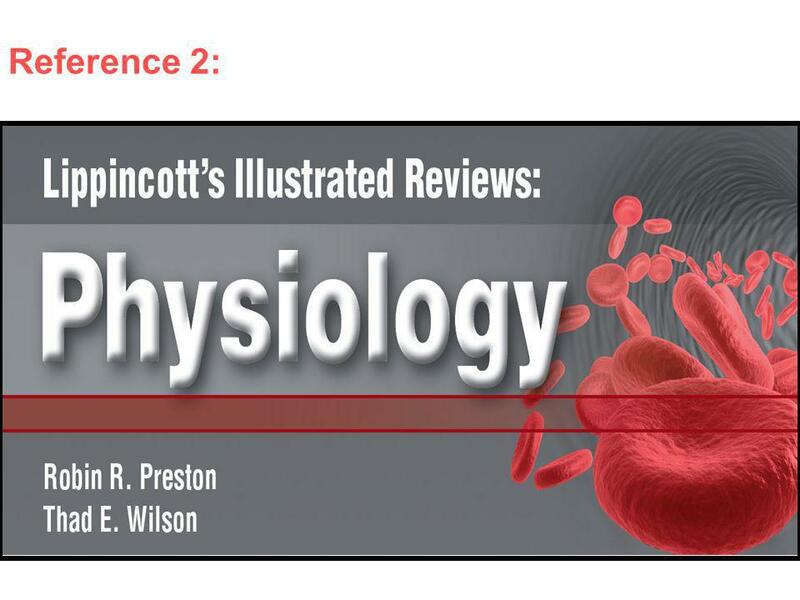 Cardiovascular Pharmacology Review of Cardiovascular Form and Function. 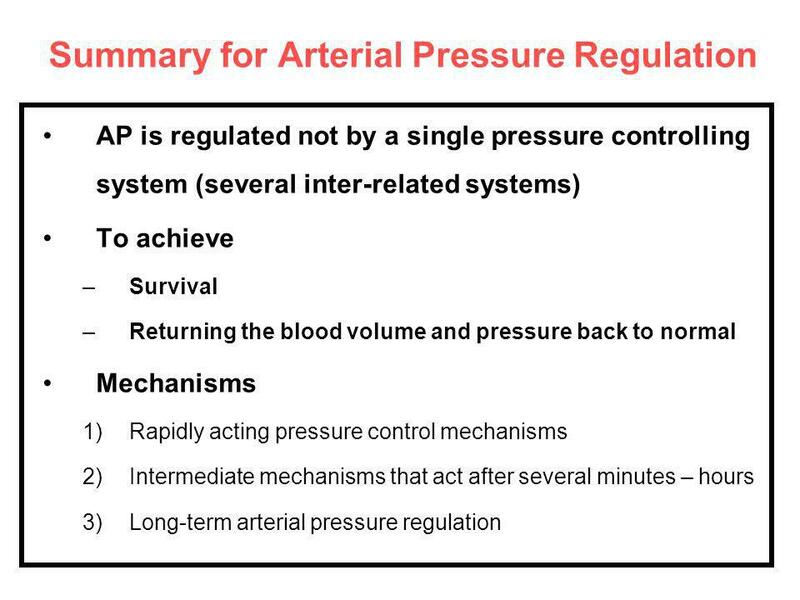 REGULATION OF ARTERIAL BLOOD PRESSURE TERMS SBP DBP PP MAP.